Last edited by Envious Mods; 07-22-2016 at 03:24 PM. 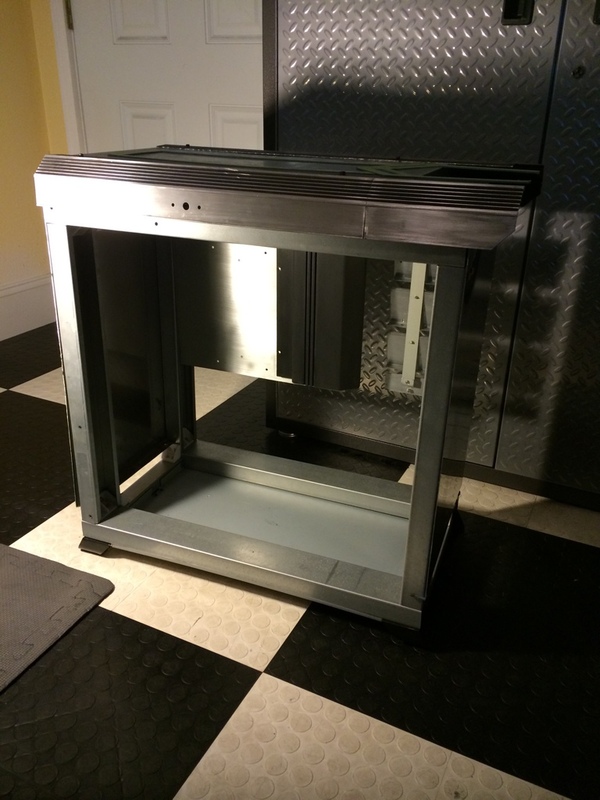 Now that I have the basic structure together, its time to start wrapping the case. 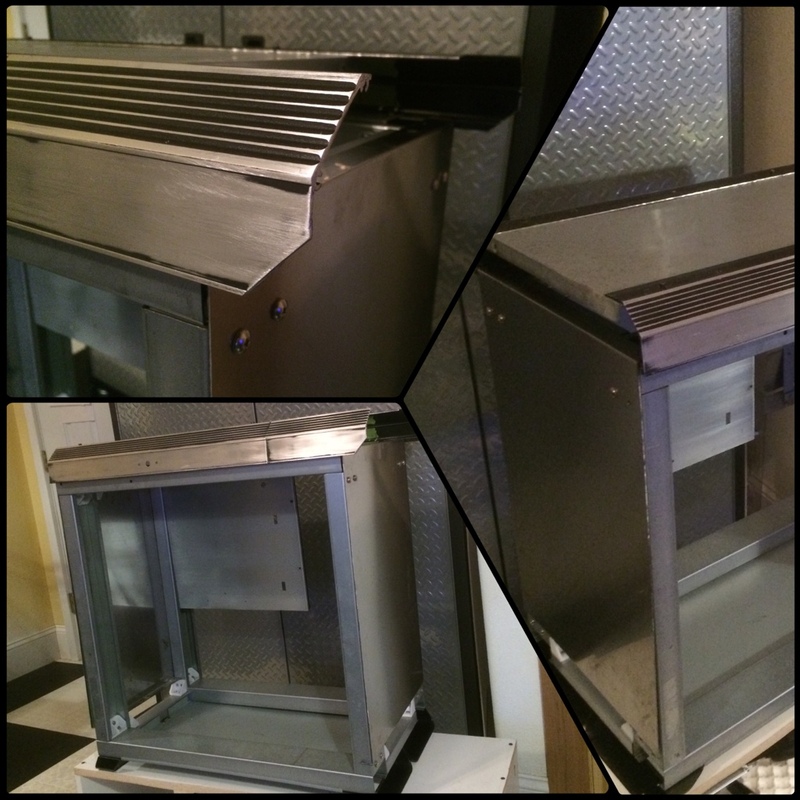 I went with stainless steel for the front and back panels. 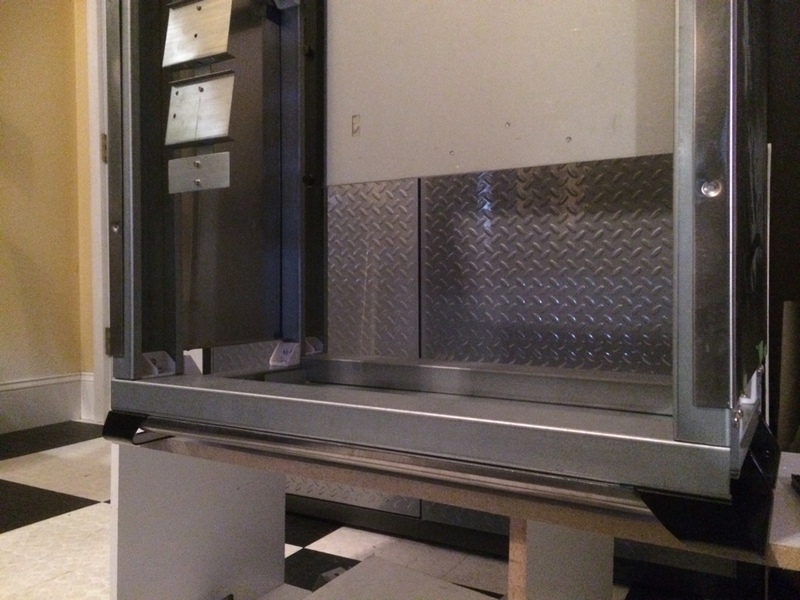 There will be quite a few pieces that will be built on top of these panels; stainless is a good strong base for those elements. 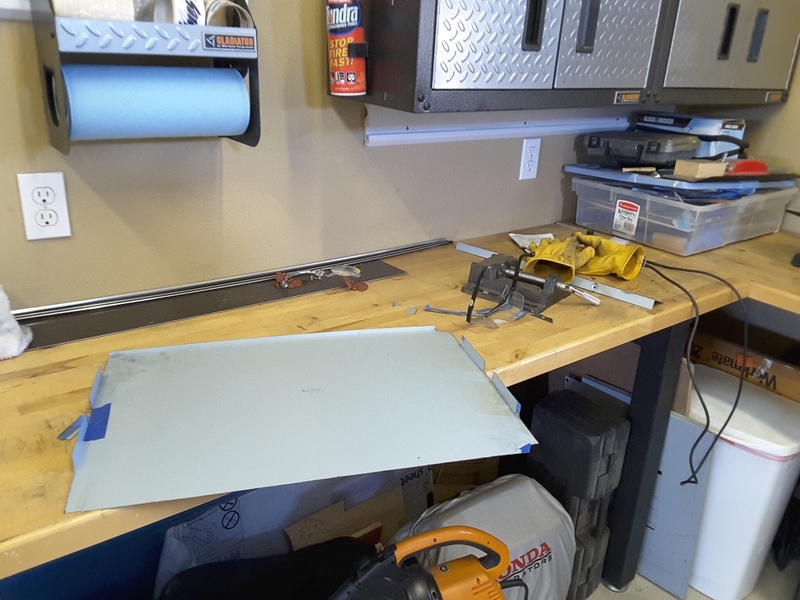 The two panels I have are a little bit wider than I need so I will need to make a couple cuts once more cutting blades arrive. 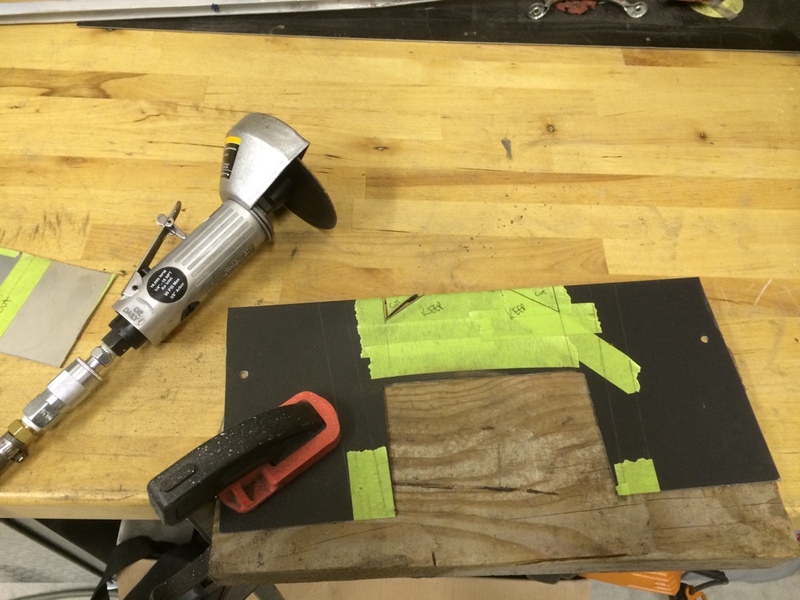 For now I can test mount the panels and double check where they need to be cut. 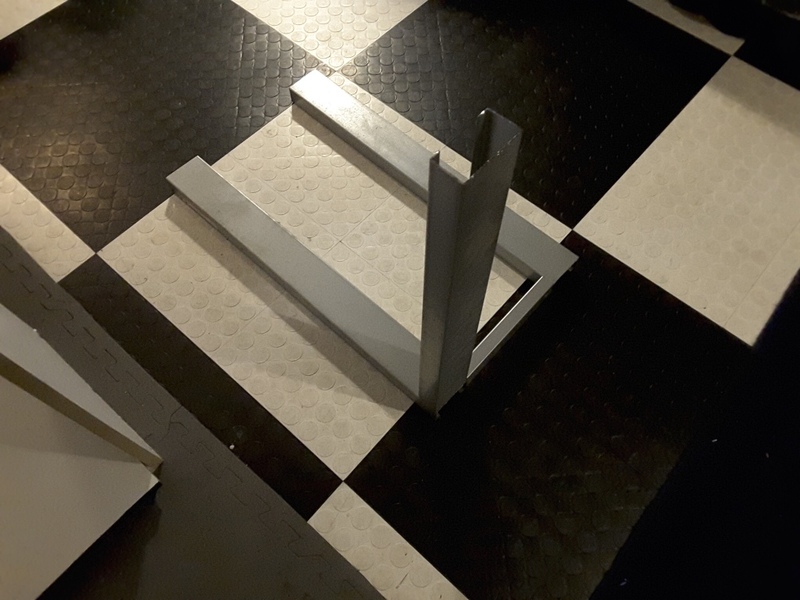 The bottom panel took a decent amount of measurement to make sure it fit correctly around the feet that have already been mounted. This part of the case will be covered up but it will have about a 40mm gap. 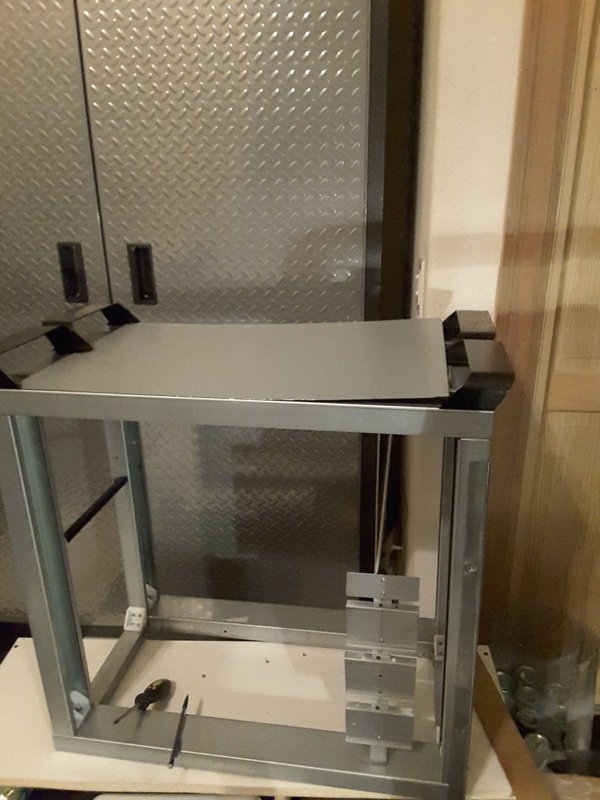 This gap will allow me to run some of the wiring so to wont be seen. Down the road to will come in handy to access any wiring needed for maintenance or upgrade. 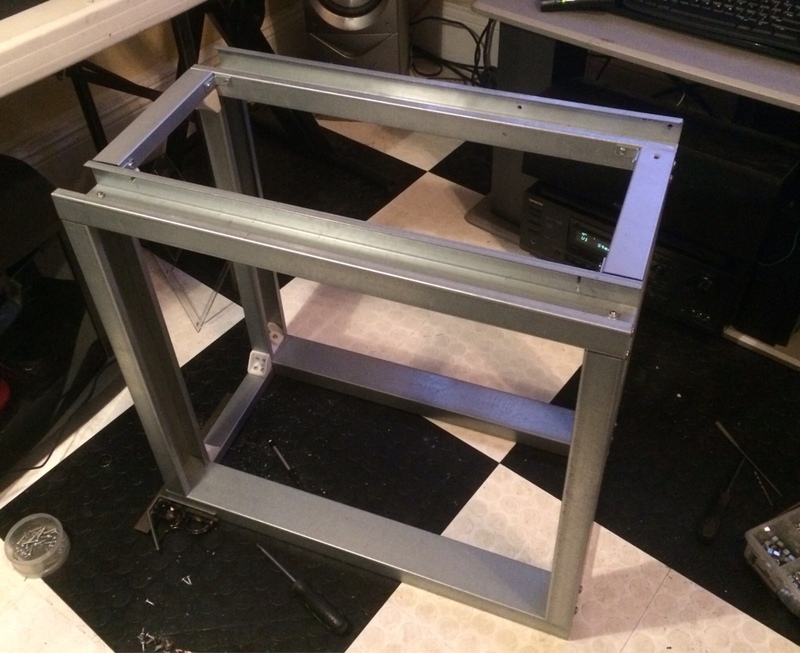 I started cutting out the sub-mount for the motherboard and the passthrough for the water-cooling. 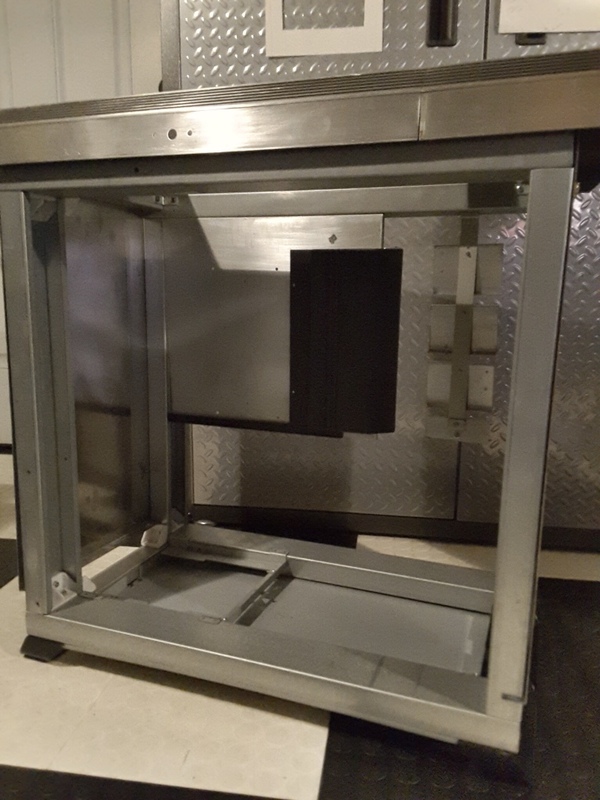 I used heavier gauge steel because this mount will also have to hold the giant water-path that will go on the back side of it. For right now I just have it mocked up so that I can get an idea of the spacing. 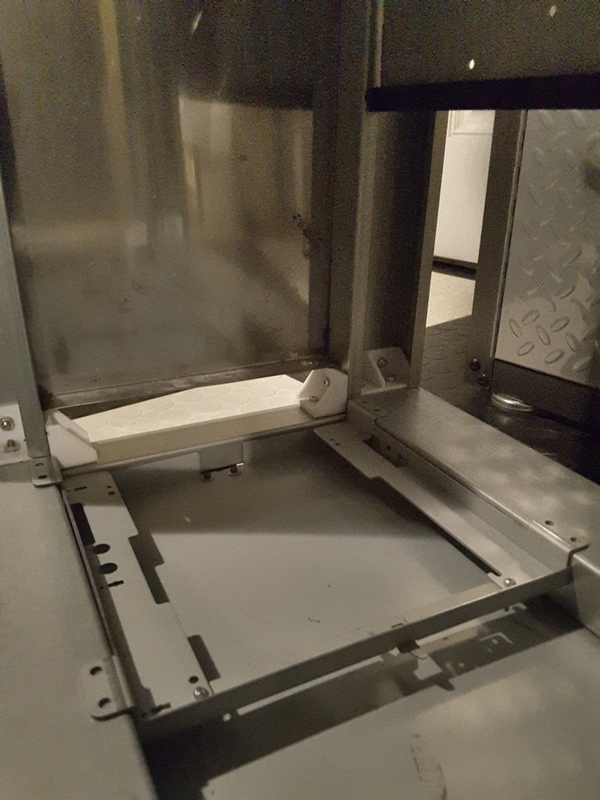 I wanted to 3D print the custom hinges I designed for the outside of the case. This will let me know if they will be big enough. I am using the 1mm nozzle on the metal Printrbot UBIS 13s hotend. 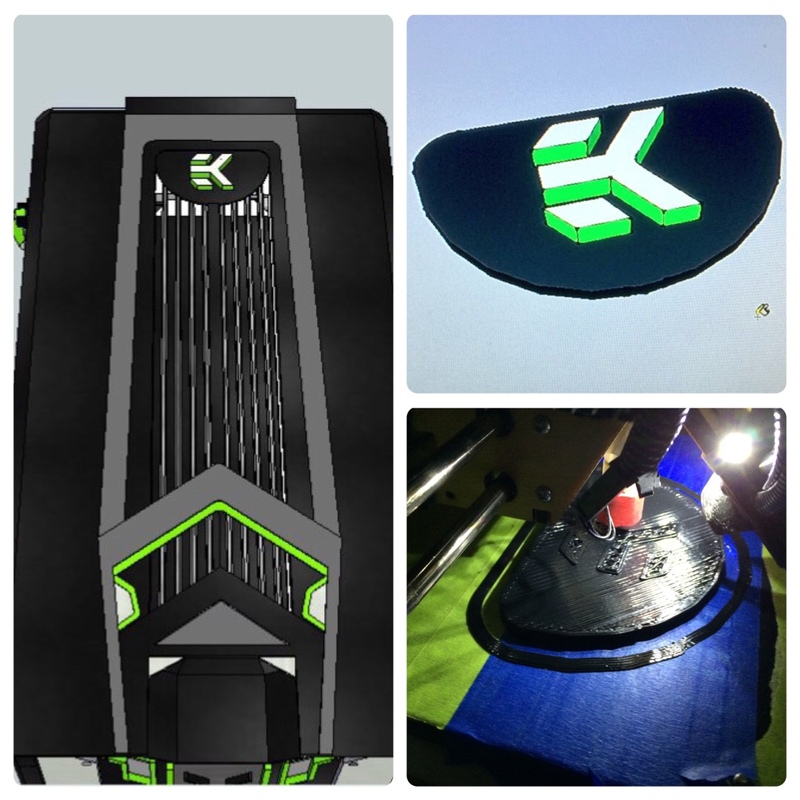 This allows me to print my designs much quicker than I could before. The resolution isn't as high as it would be using a much smaller nozzle but, the advantages outweigh the disadvantages. A 45 minute print takes about 5 minutes to do with the 1mm nozzle. 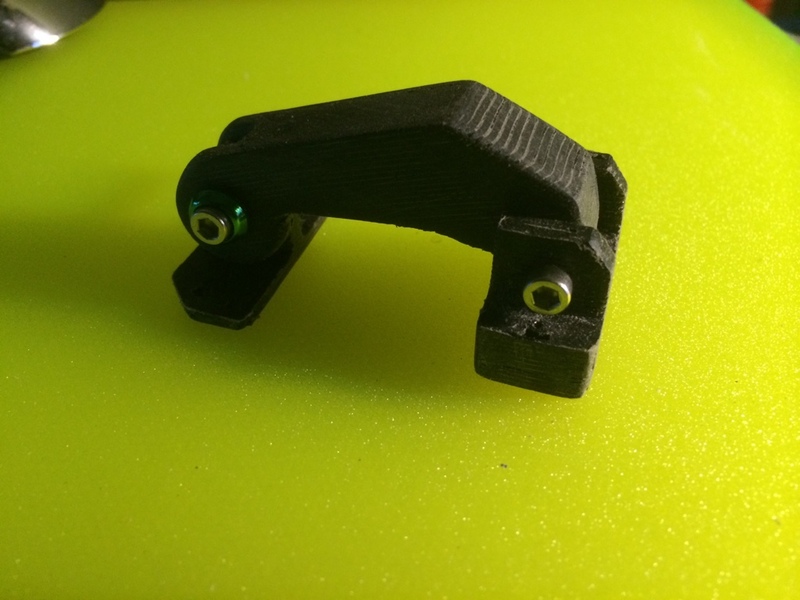 After printing the 3 separate pieces that make up one hinge/latch; I can already tell that there is going to be a few changes made for the next iteration. The overall size seems a little bit smaller than I imagined it would be. I will scale the design up a little bit to make everything a little larger and more industrial sized. The bottom piece also needs to have a thicker base. Currently its about 3mm and I think 6mm is where it needs to be. I also want to slightly change the round part where it connects to the middle piece. These changes will be quick when done within Sketchup. After I finish the changes I will print another prototype to make sure its ready for the final pieces to be made. There are a lot of pieces that go together to make up the front panel. The majority of it will be made out of acrylic and aluminum. 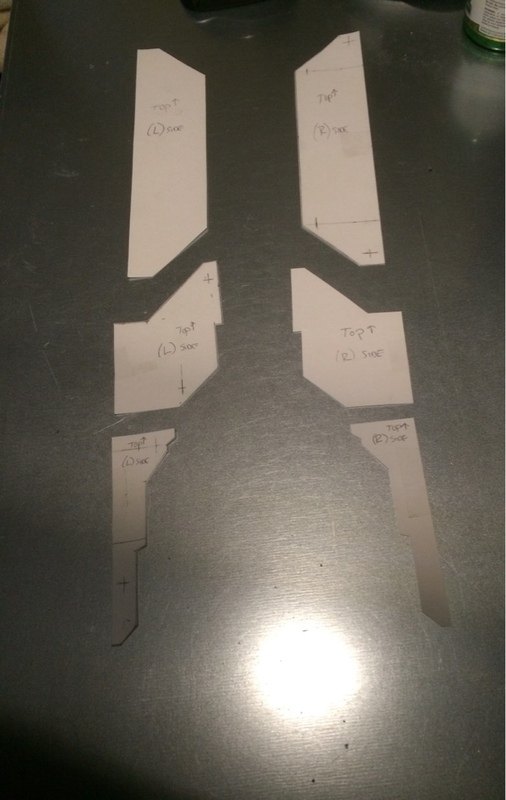 I have translated the first 6 pieces onto a template that I can use to cut them out of acrylic. I will be using acrylic that is about 7mm thick for these pieces. 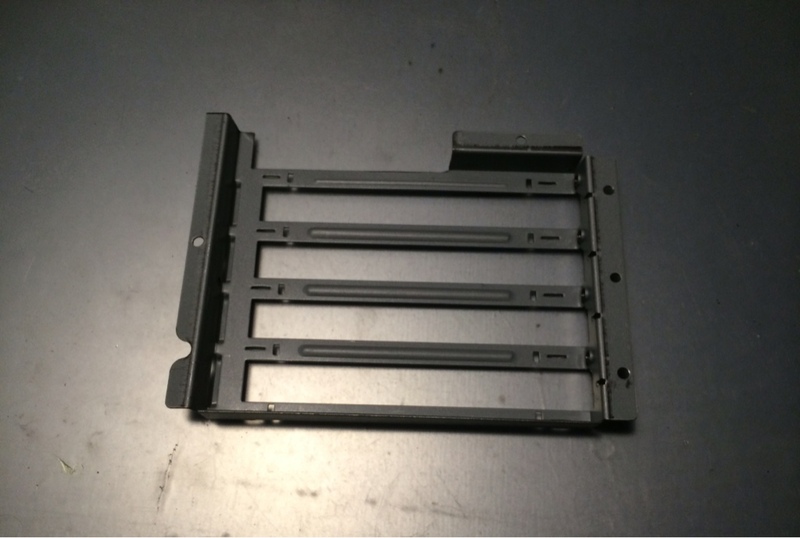 They are designed the pieces to different thicknesses for the front panel. This will give it more dimension once assembled. Some of the pieces will be layered on top of each other. 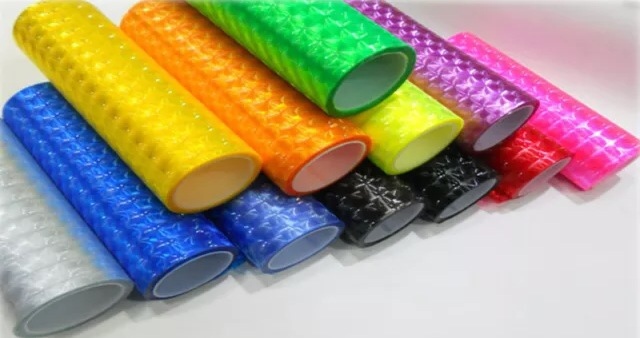 Layering different thicknesses of acrylic is something I love doing on my mods because it really does a great job of making the design cues stick out. All of the pieces of acrylic are first hand cut using my scroll saw and then sanded/filed to make sure all the edges are perfectly flat. I make good use of a large array of different types of files and sandpaper. 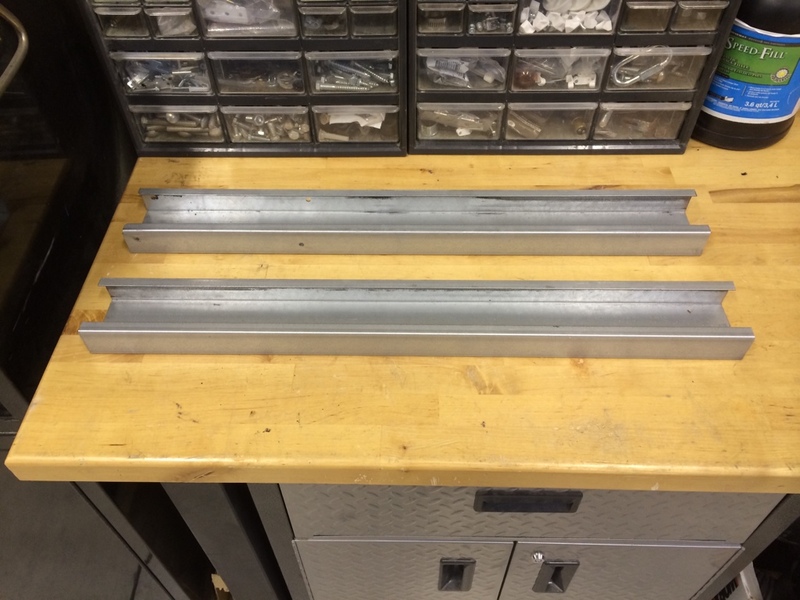 Typically it'll start off with large hand files to remove enough material to take out any bumps or mis-alignments. After that I will use needle files (small files.) Once all the markings are filed out I will move on to 200 grit sandpaper and rotate to progressively finer grit sandpaper for a smooth finish on all the edges. Its a long process but, I find it to be somewhat meditating after a while. Im the type of person that is always willing to learn new techniques and tools to put in my modders tool belt. When my buddy said he had some time available at his metal fab shop I jumped at the opportunity. 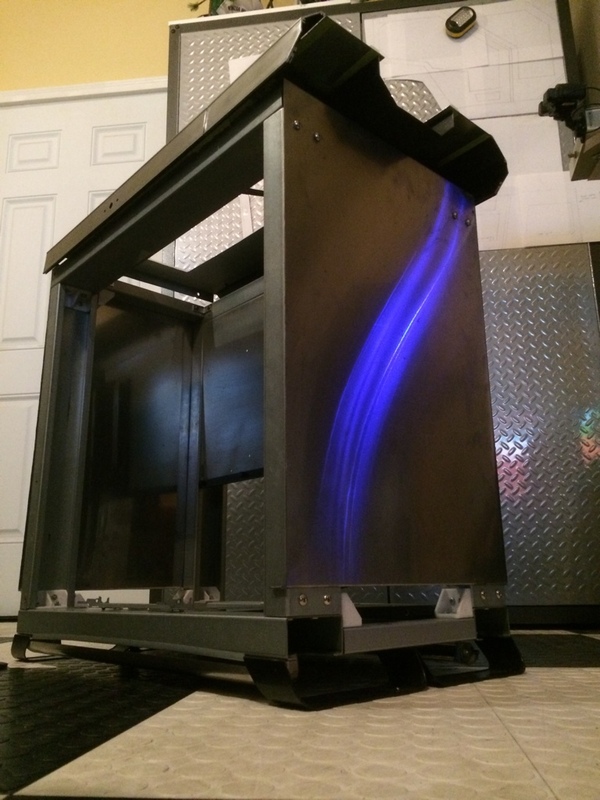 I wanted to learn something new so we jumped into making some bends for the bottom side of the case. 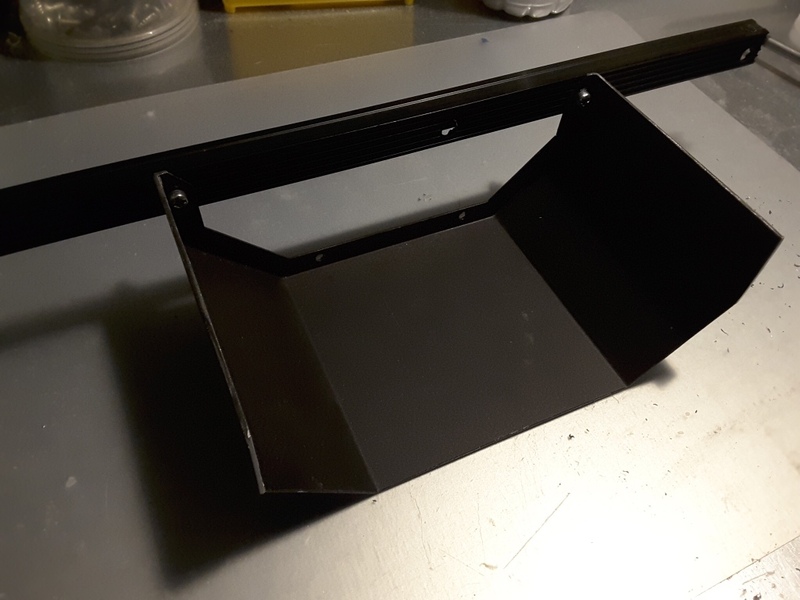 These parts wont really be seen much once the case is completed but, its one of those small details that add up to make a case thats memorable. 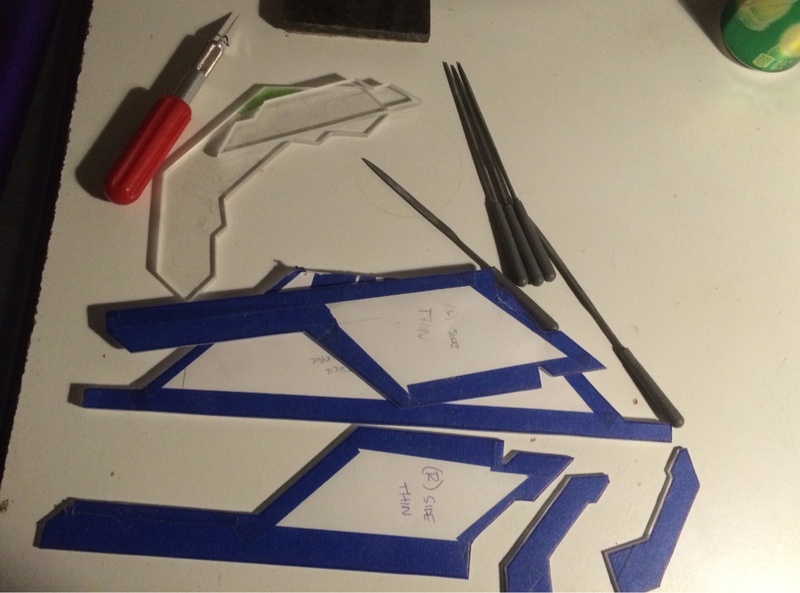 Today I managed to cut about 10 more pieces of acrylic out for the front panel. 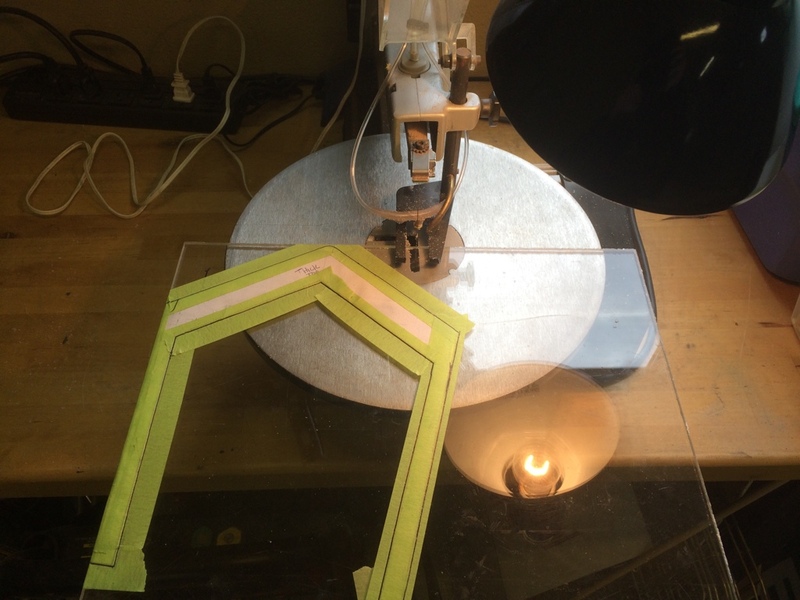 Doing a little bit at a time helps me not get burnt out on the scroll saw. 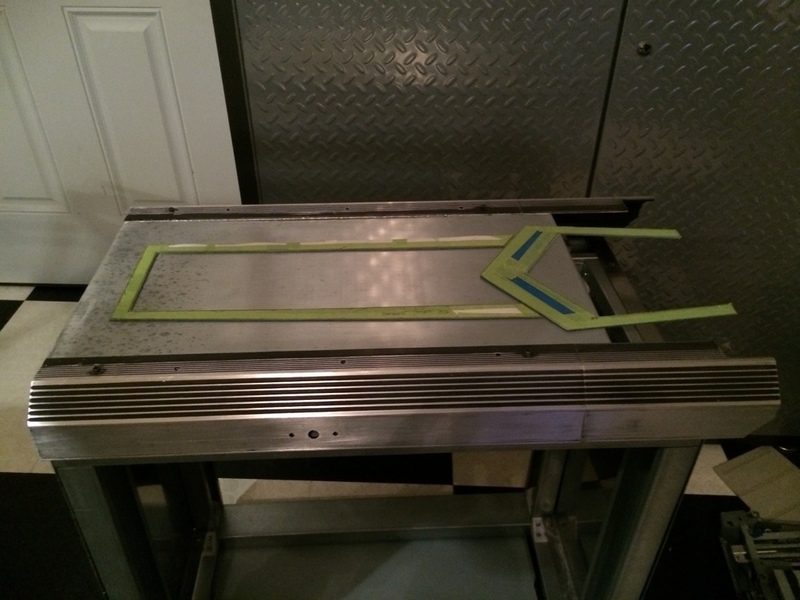 Most of the pieces I cut consist of the bottom layers and the grill inserts. Theses pieces are cut out of thinner acrylic that is about 3mm thick. Now that I have a decent amount of the panels cut out I started to lay them out to see what they'll look like. So far they are dead on the design I did in Sketchup. Lately Ive spent a bunch of time doing metal work. 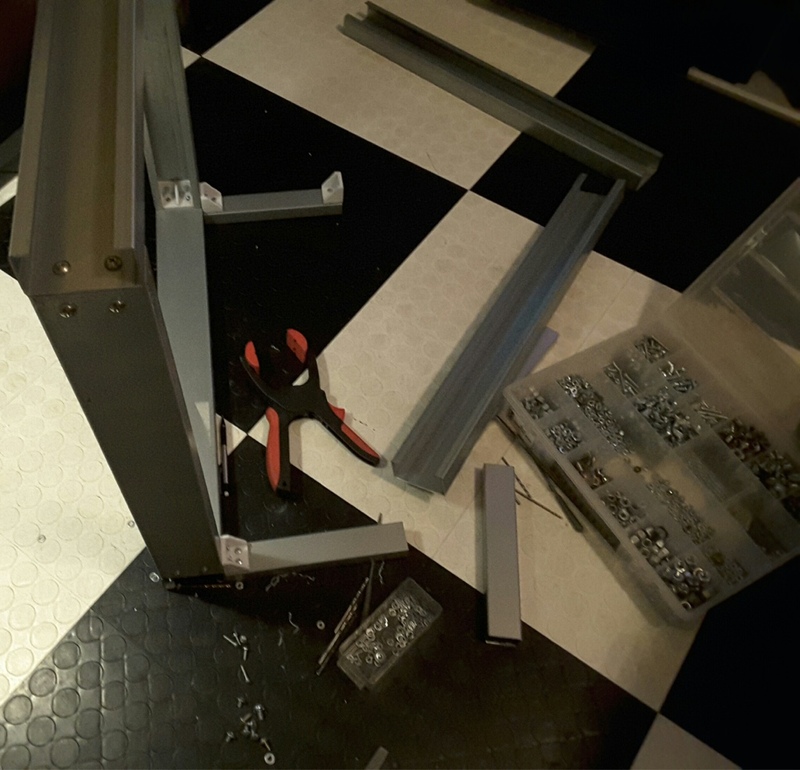 Unfortunately my Dremal kicked the bucket on me so I had to buy a cheap rotary tool to get me through this build. Currently I'm looking into buying a new metal cutting tool. I haven't decided between electric shears, die grinder and a few others. I managed to get the back panel all mounted a fit correctly. A decent amount of time has been spent getting the top angled roof together. It has an partial octagon shape along the top of the case that is kind of hard to see in the design screenshots. The entire top slides on a track. This makes getting to the top of the case easier in the future. It also sits a bit higher than the top of the cases frame. Im not a 100% sure what LEDs ill use and where. I invested in a little bit of everything when it comes to LEDs and accessories. I have cool white, green, blue and natural white LED strips as well as a couple different kinds of 5050 RGB strips with wireless controllers. Recently I managed to get a smoking deal on LED strip extenders, mounts and cables. 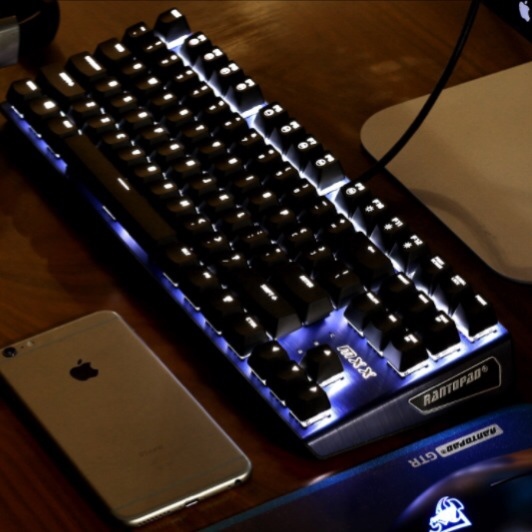 More than likely I'll end up using the RGB LEDs as they give a wide range of options. 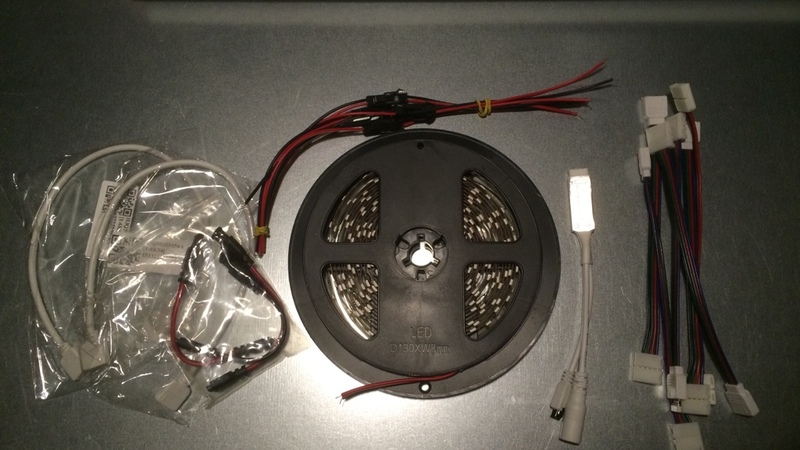 The smart LEDs also showed up recently which will be a great addition to any case build. Ive haven't seen them used yet on a build. It'll be neat to see how they look once they are all hooked up. Most of the skills I use are passed down generation after generation. I like to hand build as much as I possibly can and I will typically translate CAD drawings into 2D sketches. 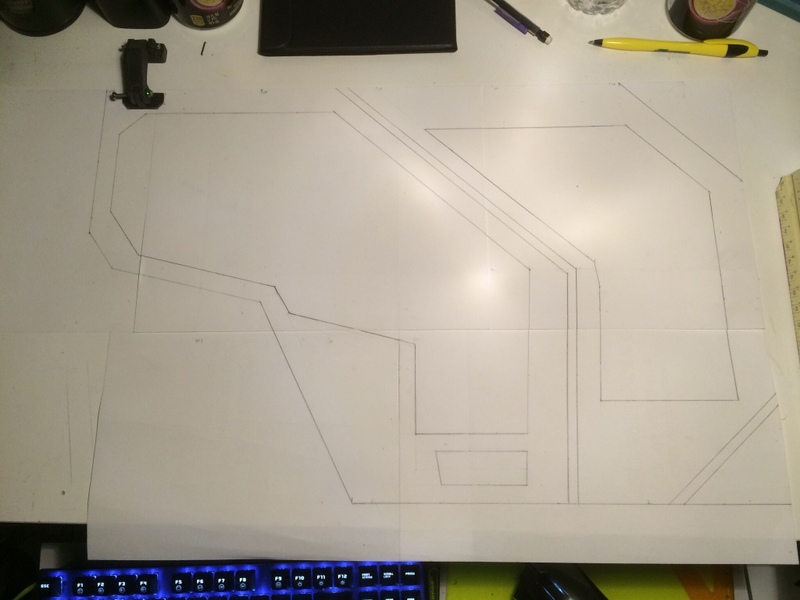 Doing so allows me to make templates to scale. It takes a decent amount of time to do it this way but, it also allows me to really know the design well. With all the technology I have at my disposal I still can't get away from doing it this way. 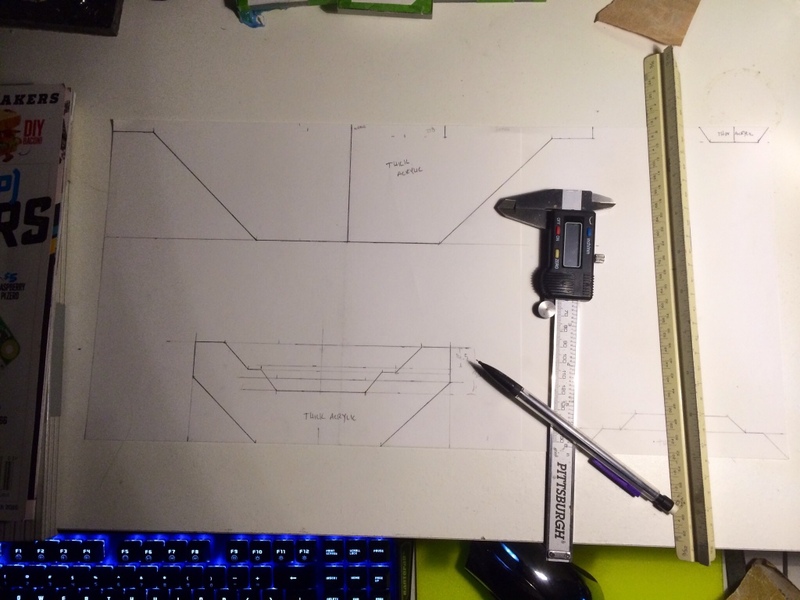 Today I've been working on sketching out the main features on the top portion of the case. This is the portion of the build where I start coming up with crazy ideas that usually come to me in spurts of inspiration followed by eureka moments. 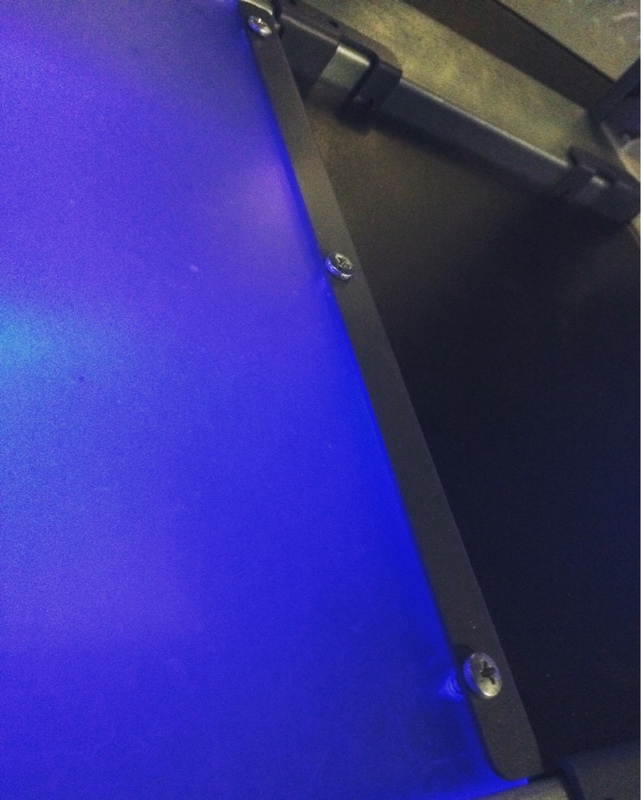 Being the noted Rain Man of Modding I leave certain parts of the case intentionally un-designed. Being my favorite part of the process; I typically get excited and sometimes need to be reeled back in. The first idea I received, while eating a bowl of corn flakes was to do a custom animated case badge. With the use of a mini TFT touch screen I plan to add a badge to the front of the case which will have a short “Dark Matter” animated design. I have ordered the touch screen and luckily I already have the other parts required to do this animated badge. I will be running it off of an Arduino Mega. I went with the mega due to the larger amount of memory which is required to do animations. 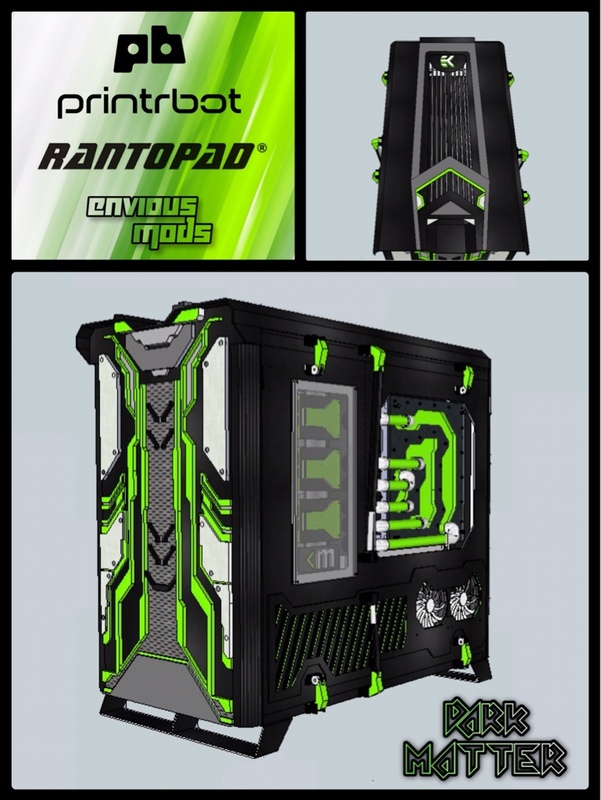 Thanks to RantoPad I will have a MXX Mechanical Gaming keyboard and mouse to mod for this build. I haven't nailed down the exact design I will use but, it'll match the case. I will carry over the design queues in order to make everything look as one cohesive family. The keyboard and mouse will be almost completely stripped down once I decide what I'm going to do to them and paint arrives. 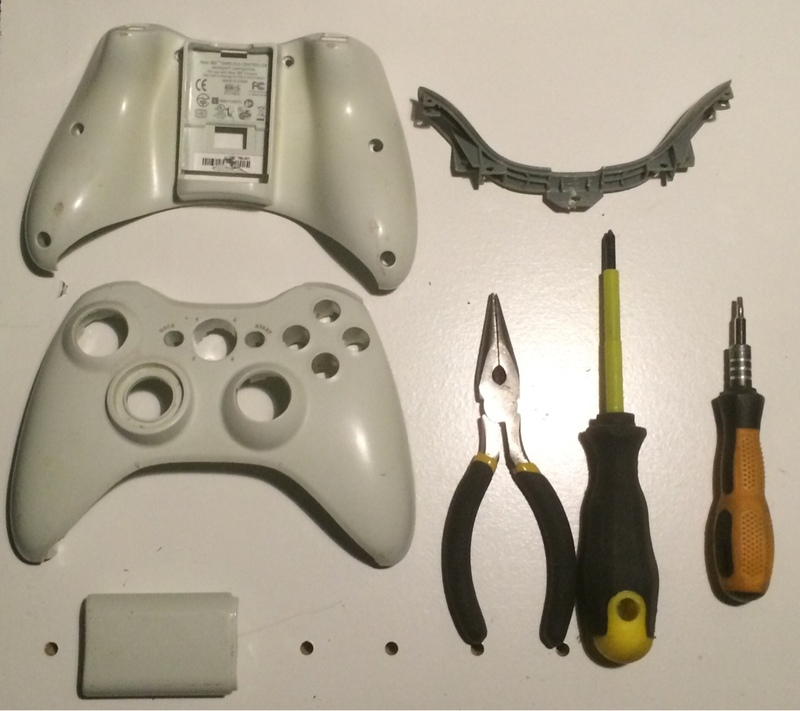 An Xbox 360 controller will also be modified for this build. I received a used one due to the fact that ill be ripping it apart. It will be matched to the rest of the build as well. 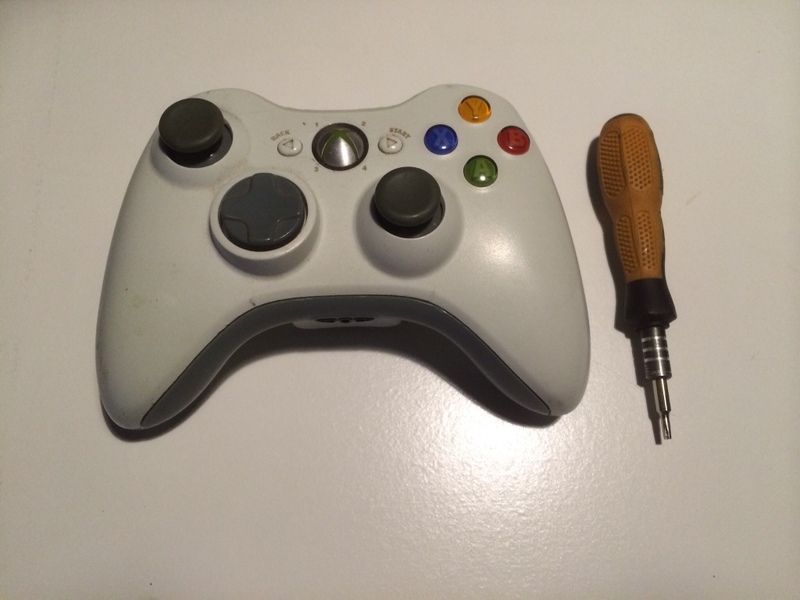 Taking apart the Xbox 360 controller is pretty straight forward. Use a Tx-8 or a small flathead to get their proprietary styled screws out of the back of the controller. One screw is hid behind a sticker in the battery tray. After those are removed you can start basic disassembly. All painted surfaces are prepped using sandpaper. Once I finalized a design I will use my vinyl cutter to make paint templates. More than likely I will break out the airbrush for the controller because it allows me to do more detailed work and its awesome. Like many other modders, I have a special place in my heart for acrylics and poly-carbonate. Its such a versatile material. Over the last 8 yrs its really become my go to for materials. Recently I've stumbled upon a bunch of different techniques and ways of manipulating acrylics for case mods. 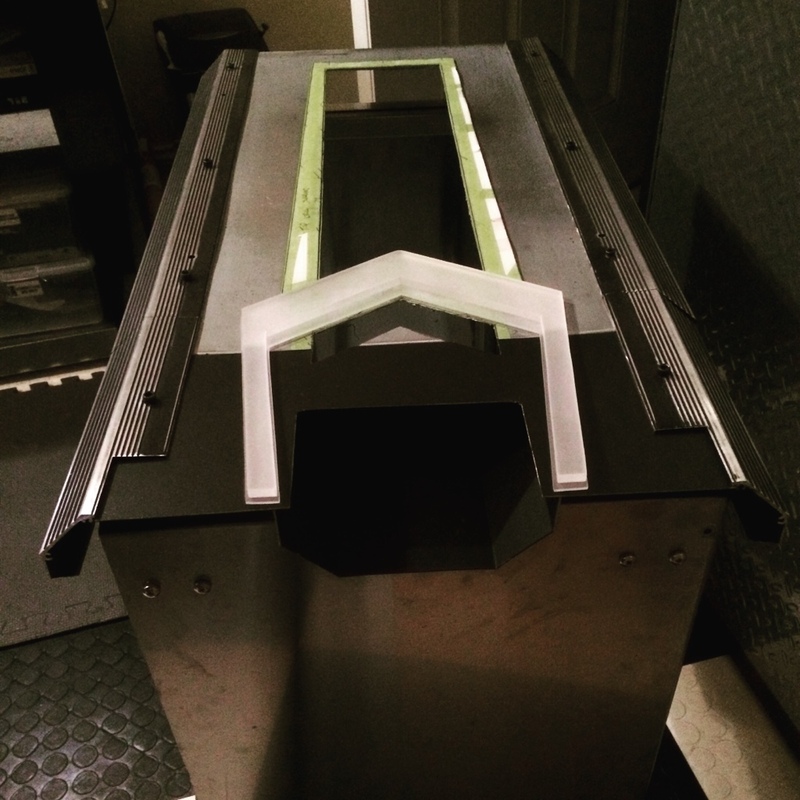 I designed this build to take advantage of multiple thicknesses of acrylic. Layering several pieces adds a ton of dimension. This scratch build has a ton of detailed pieces. Do to the fact that I'm partially crazy; I still hand cut every single piece. 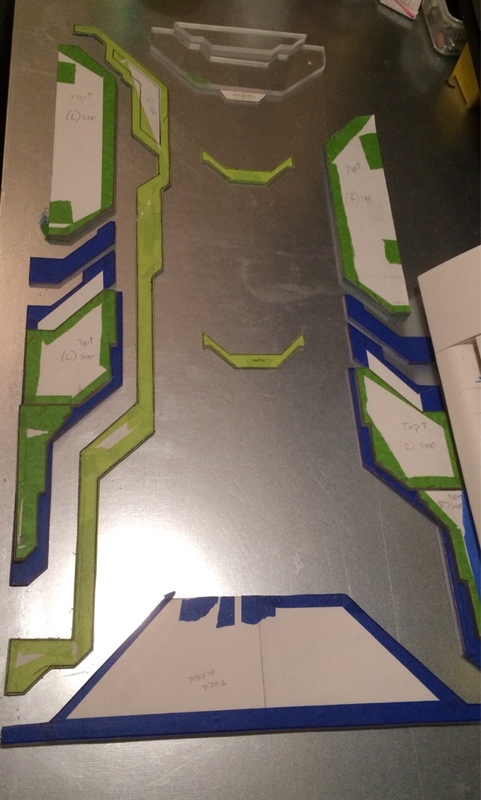 The last couple days have been spent making templates and cutting those pieces out. Now that I have most of the pieces for the front done, I have turned my focus towards the top of the case. Some of the panels on the top are really long and take quite a bit of time to do the finish work on. 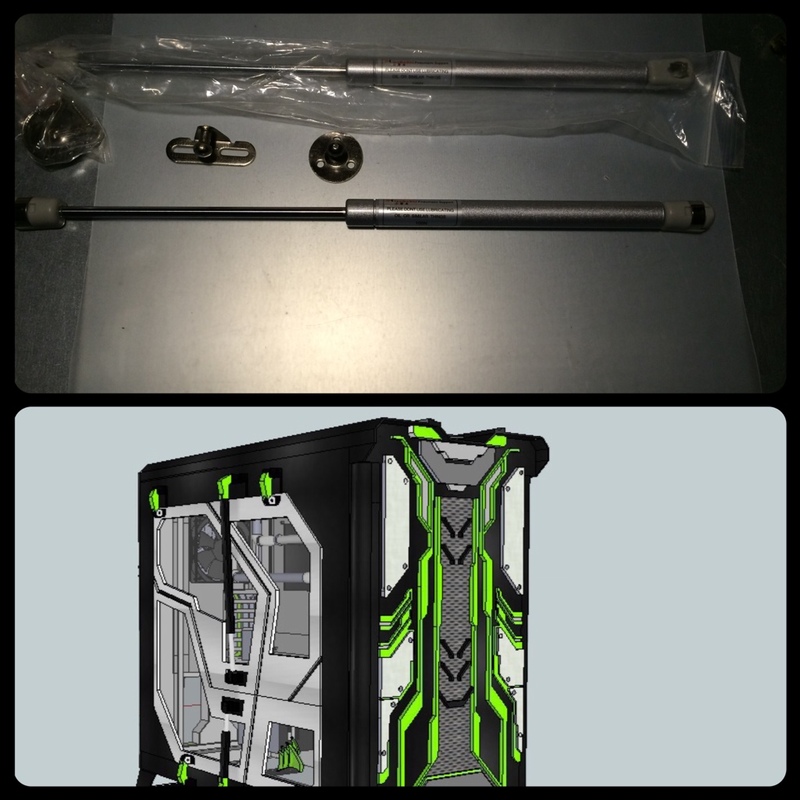 Today two of the longer gas struts arrived. I will be making a few modifications to them. 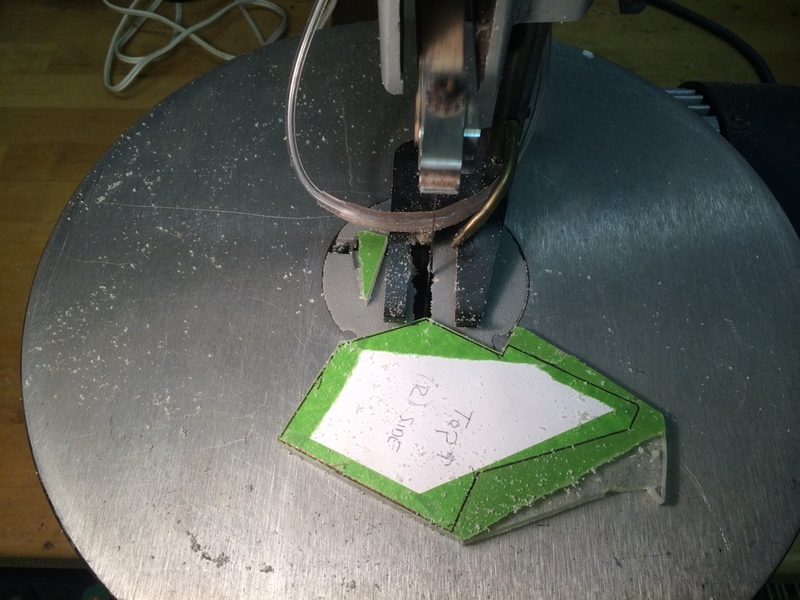 The main modification consists of 3D printing new mount brackets for them. This will help them fit into the aesthetic look I'm going for. They are silver and I might paint them before it's all said and done. 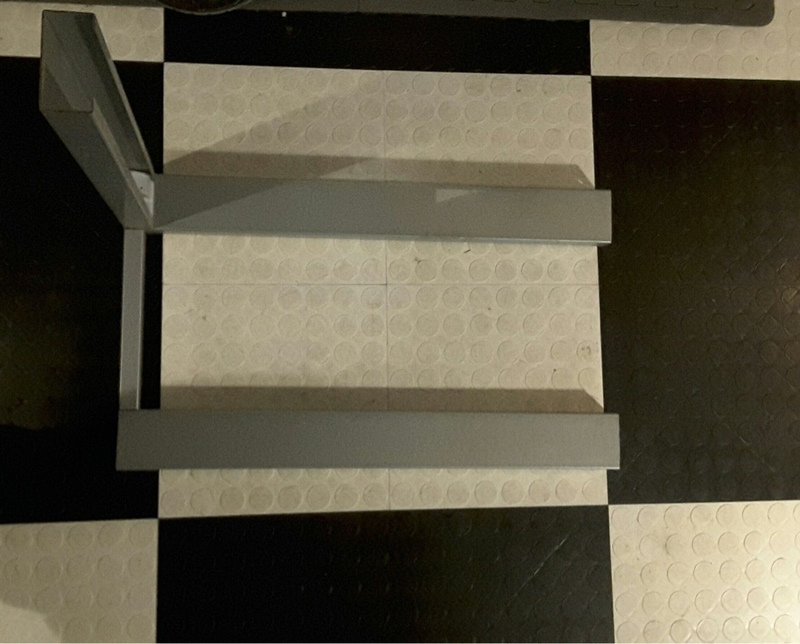 Being a huge fan of OCD; they'll probably end up being paint matched unless they just so happen to match. The smaller two gas struts are on back order so it may be a bit before I can get those. I also ordered some vinyl that will be used in a few bits of the build. I went with an Icy Silver which has a lot more depth than a flat or gloss. 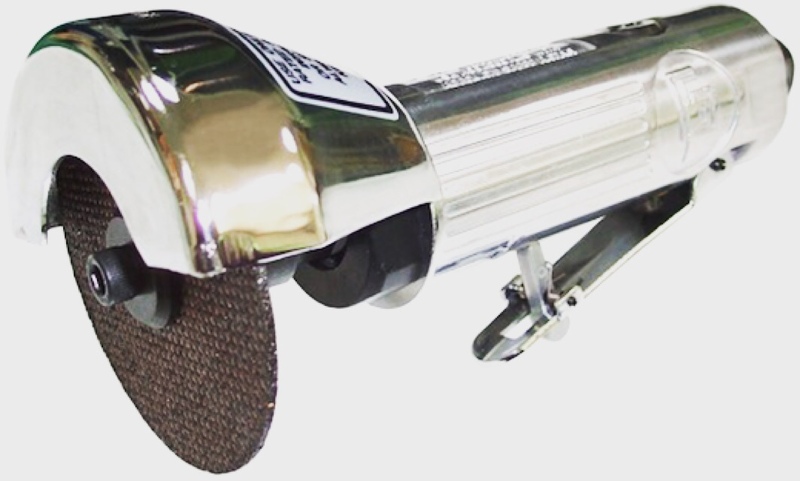 It's primarily used in the automotive industry so it's usually a lot more expensive than your run of the mill vinyl. (either that or I've been had) I've dealt with this supplier before and I have always been happy so I have high expectations. Ive been 3D printing parts for years and I've always had an issue with the amount of work it takes to smooth parts to prep them for paint. Theres multiple techniques to accomplish this but, most of them are dangerous, expensive or a pain To do. This issue has become larger due to the new 1mm nozzle I'm using. 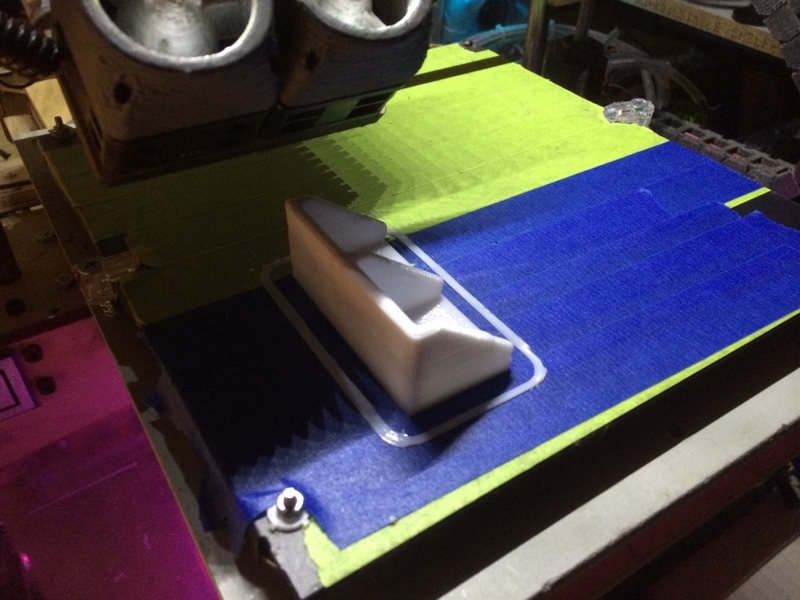 The 1mm nozzle allows me to print large models very quickly but, resolution is an issue when you want smooth prints. Ive spent a lot of time trying to find good techniques that don't change the dimensions of a print but, leave them nice and smooth. The first technique I will attempt is using a more common filler called, "under cover" and later a marine epoxy. The epoxy will make the piece up to 40% stronger, it wont change the dimensions and leave the model water tight. These qualities are very important to the 3D printable water-cooling parts I've been designing. Being able to print your own water-cooling parts has been a dream of mine for a long time and this technique is the best shot I have at accomplishing this. Ive witnessed lots of people attempt to make these water-cooling parts and while they work early on; quickly they start to degrade. I am currently gathering the materials to test the first model and I will post results after each phase of tests. I designed a piece that goes onto the top grill. It has a base plate that the logo sits on. Its been 3D printed on my Prinrbot Plus with dual extruders using a 1mm tip. After it was printed I sanded the majority of it down so that I could apply brush on filler. The brush on filler helps to smooth out any ridging or imperfections in the layers of the print. The filler os applied 2 coats at a time and sanded after which helps to smooth out the surfaces. This piece was rather tricky and very difficult to mount. I decided to mount it so it can be swiveled open like a door. This option gave me easy access while still being hard mounted. I used rubber dampeners which lets me adjust the amount of tension on the hinge. It can be tightened down so much that it will hardly open. 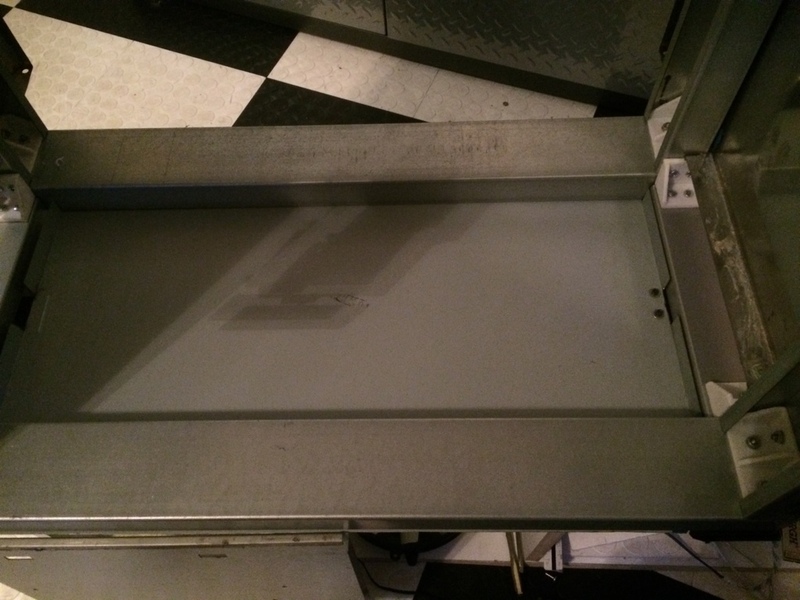 As you can see in the design the giant rear water path/reservoir goes through this plate to the other side of the motherboard tray. The wiring from the power supply will go up a custom cable path and inside this passthrough so that the cables come out where they are needed. This will keep everything nice and clean. 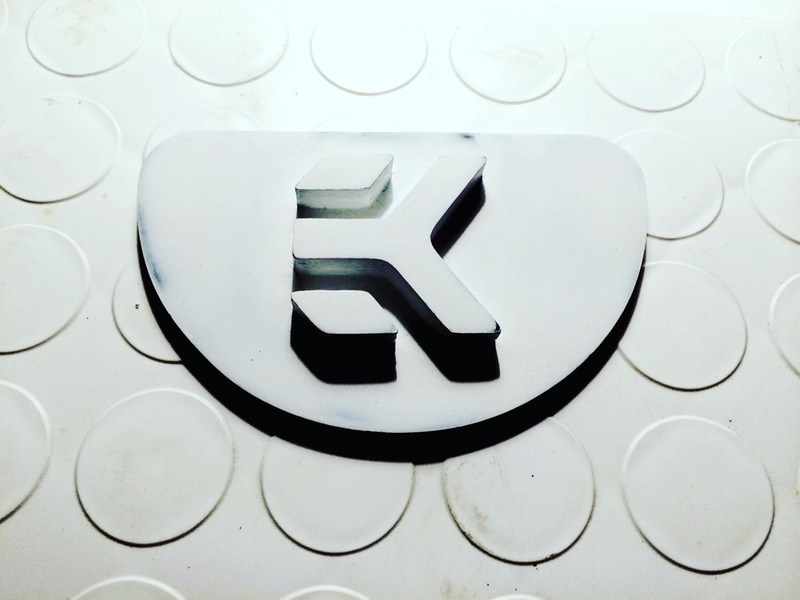 Recently I found out that EK changed their logo so that in now includes a circle around the logo. They have done the logo with and without this in the past but, the official word is that it will include the circle. 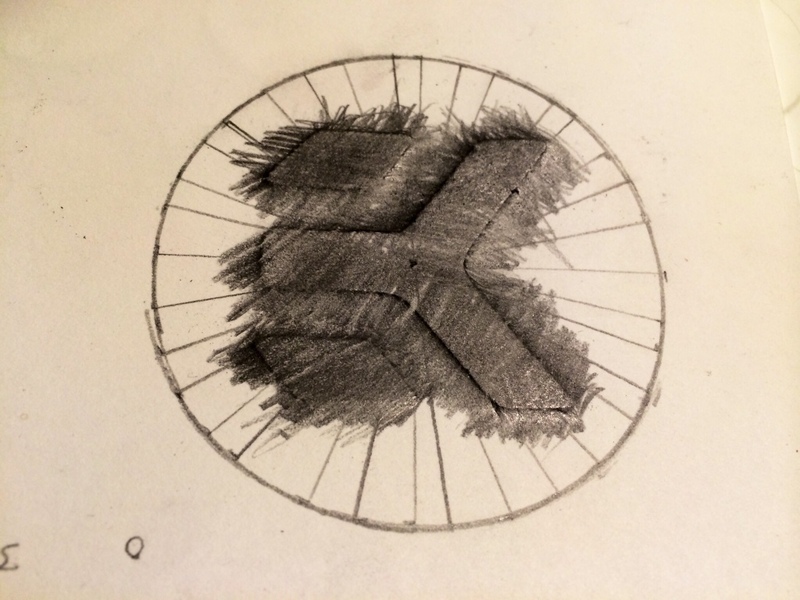 I have come up with an awesome way of adding the circle to the EK badge I have already built. I could have easily painted the circle on once I got to paint but, I decided to attempt a much more difficult option. 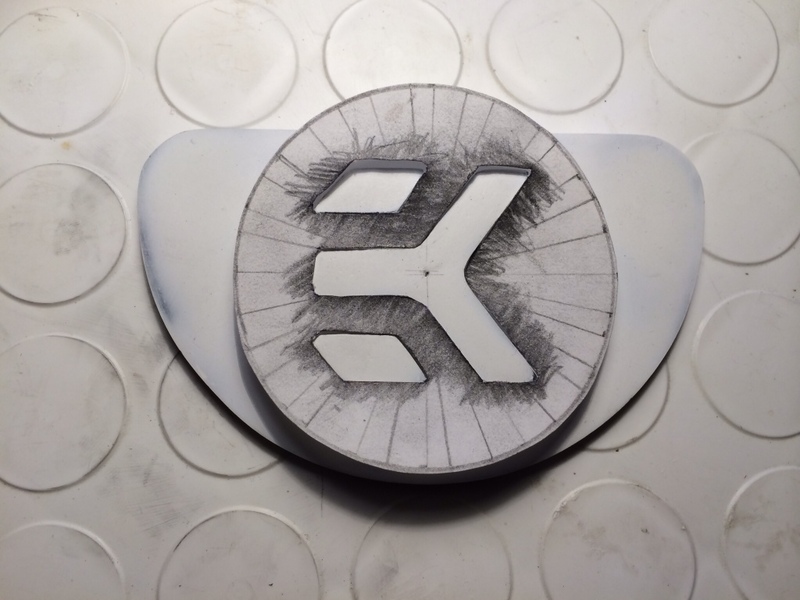 I am going to cut a circle out of acrylic that will go around the 3D printed EK badge. This will take a lot of skill because it has to fit exactly around the EK logo. 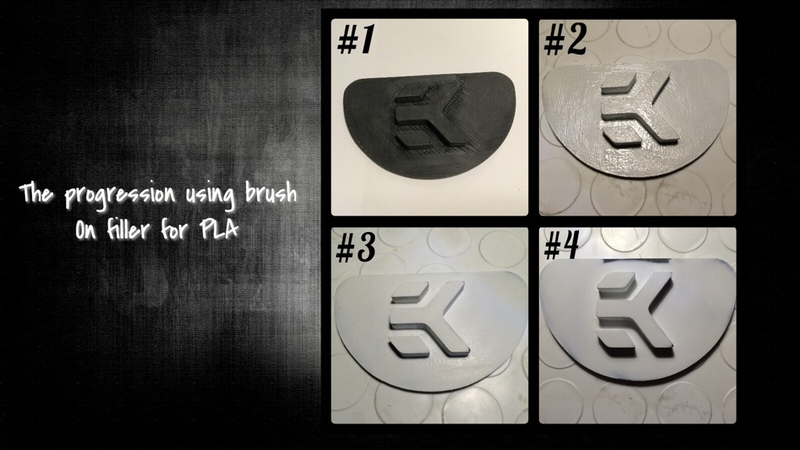 I used an old method of pencil shading to transfer the exact shape of the 3D printed logo onto a template. The only way to find out how well this will work is by trying it out. I managed to trade the tears from a baby seal for an air cutoff tool with up to a 4“ disk. Don't worry, I still love my dremal. I just needed a tool to cut long straight lines as well as a tool that could cut just about anything else I throw at it. The down side of this tool is the need for a massive air compressor to run it and the up side is that I have a massive air compressor to run it. I managed to slice a rather large hole in the top of the case. This hole will be filled with a custom grill and a large radiator beneath it. I still need to get a single sheet that will cover up the sub-mount on the top of the case. This piece will make the top nice, even and clean looking. My search for a full ATX mobo tray, rear PCI plate still continues. 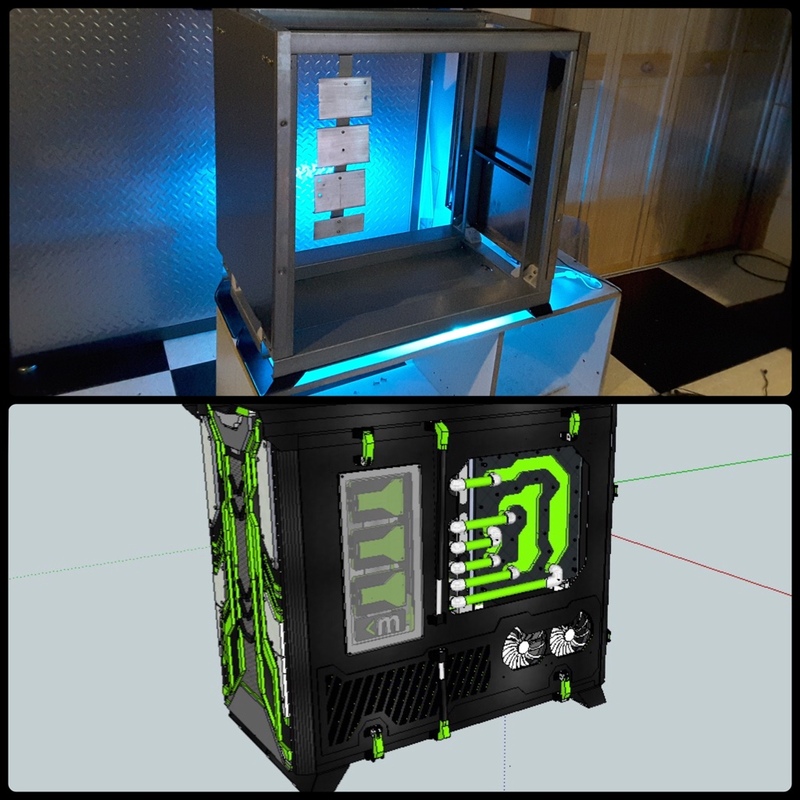 I never thought it would be difficult to find a cheap hunk of junk case on a local for sale site but, apparently every PC case is worth a ton of money. Hopefully my luck will change in the next few days. That way I can get started on the rear portion of the case. 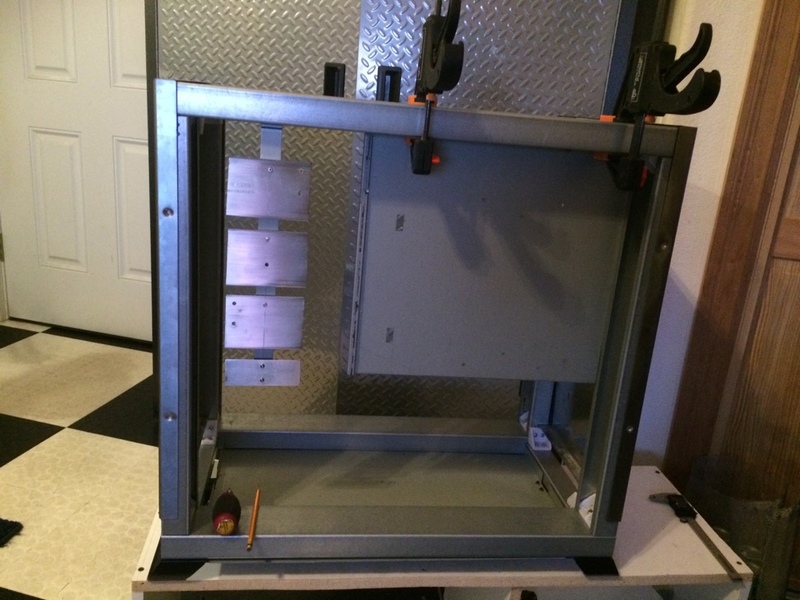 Tomorrow I will be spending a good amount of time doing metal work and cutting out the top of the case. I should have quite a few good pics of the progress. Lately I've been working on the top part of the case. 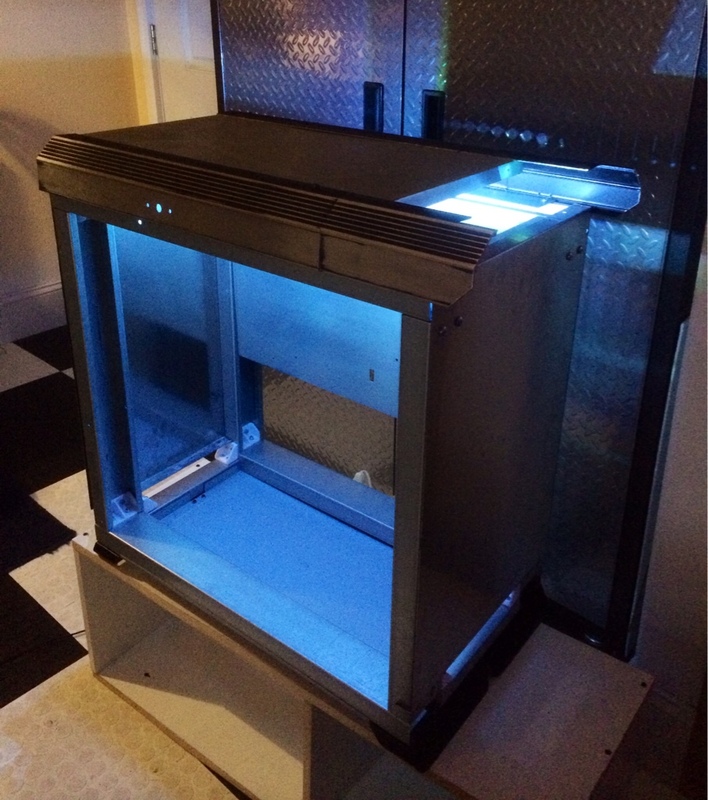 Theres a grill that I will have to custom make once I get the needed materials. 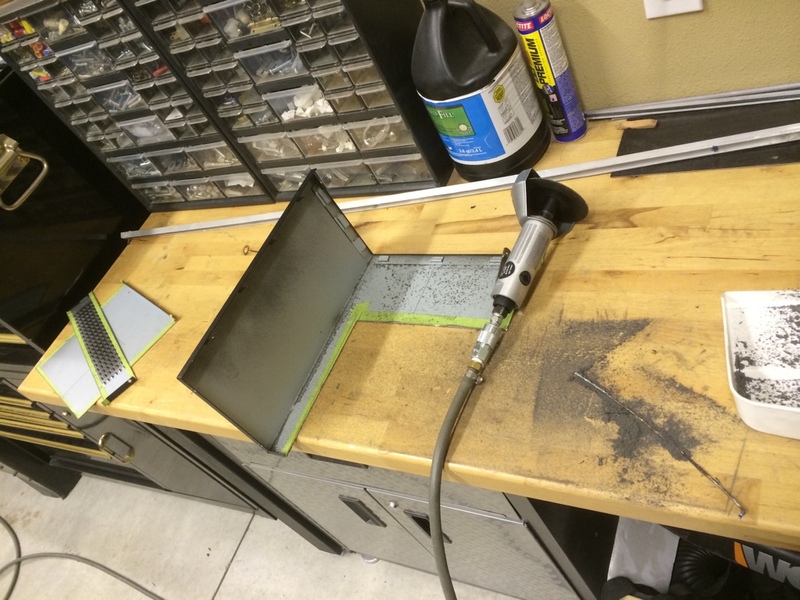 In the meantime I decided to cut the hole for the grill out of the top panel. My new air cutter managed to make quick work of this portion. Im rather impressed with its speed and accuracy. Towards the front of the top I designed a kind of cup shape. 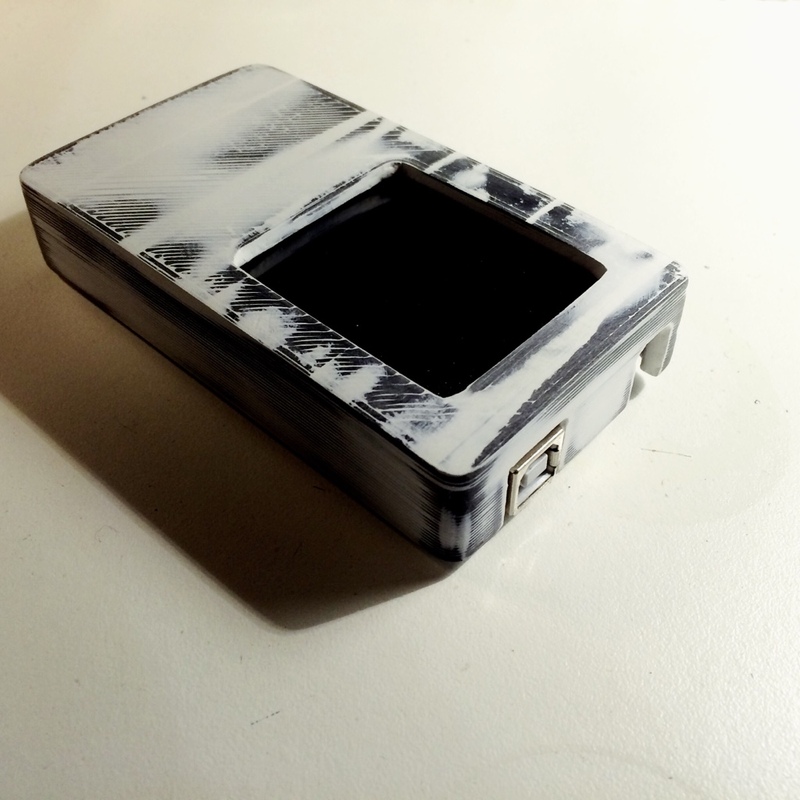 This design helps to add dimension to the shape of the case as well as work with the angles on the outer edges. 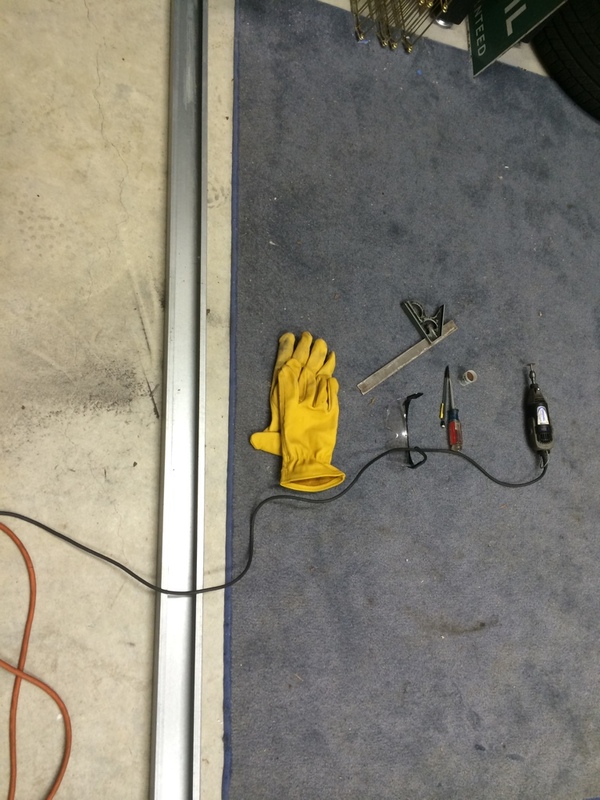 I had to use a metal brake in order to bend the metal into the correct shape. Luckily I have a buddy that let me use some of his metal working tools. Prepping the acrylic for paint has begun. I use 400+ grit sanding sponge to sand the acrylic. Ive found that this is the best method for prepping acrylic for paint. I also go over all the edges with 1,200 grit in order to polish them. I will be using automotive paint so I will only be able to prime the parta for paint as of now. I will paint and clear all the parts later on in the build. Some new parts for the build have arrived. 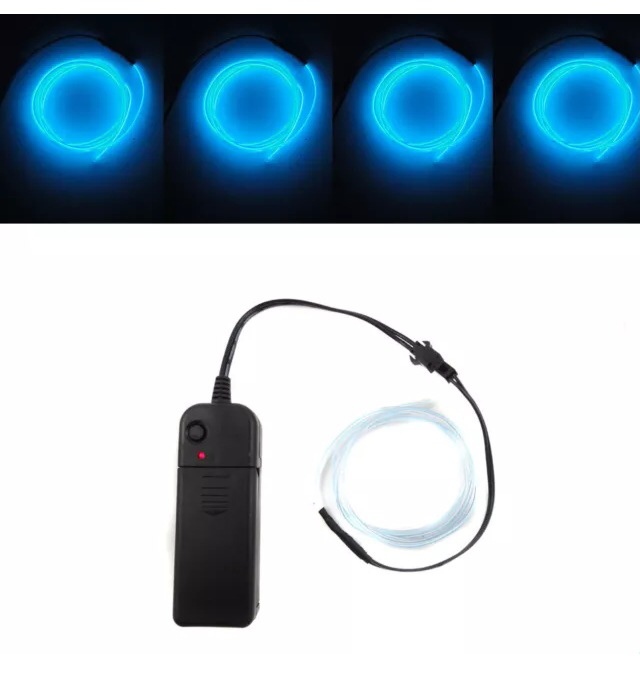 Ive never used EL wire so I ordered some to test and possibly use on this build. The EL wire arrived today along with some of the ice silver vinyl I ordered for the build. 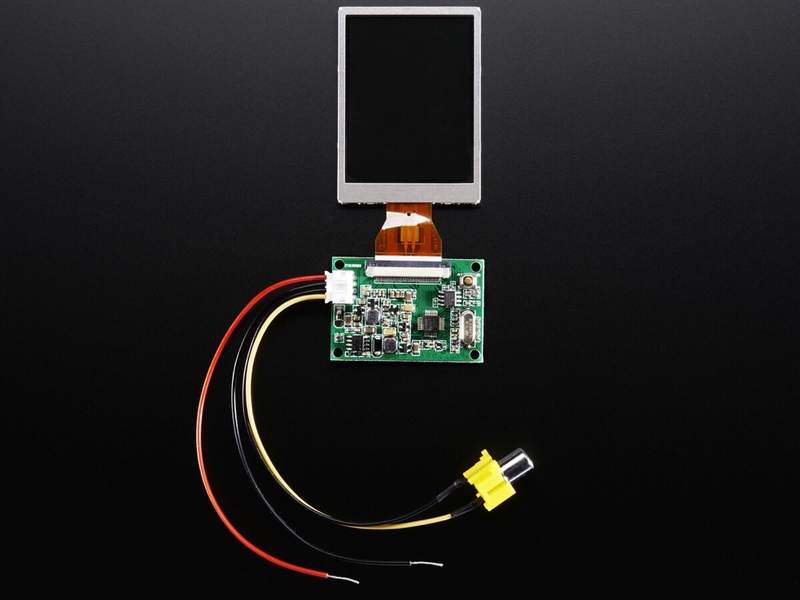 As mentioned I also ordered a small TFT touch screen that will be used as a case badge. Hopefully with the use of an Arduino Mega I can do an animated case badge. 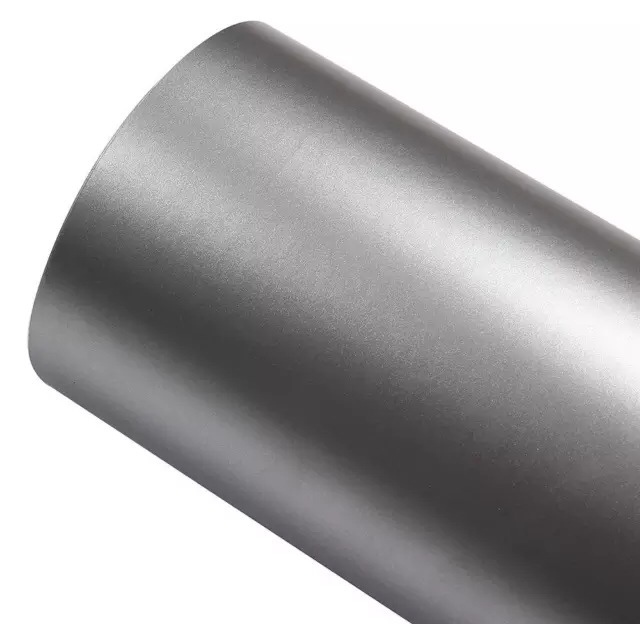 The ice silver vinyl is typically used in high end automotive color changes. 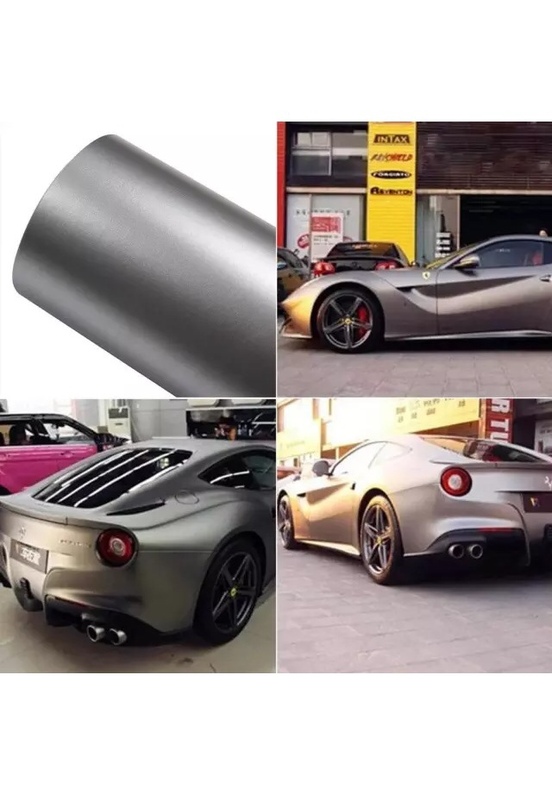 It has a lot more dimension than a matte or gloss silver. The edges and angles look darker depending on how you look at it. A while back I found some semi-transparent vinyl that came in green and black. They have a neat pattern in them and I have an idea that will look sweet. When I was anticipating this project I started ordering as many different materials as I could. Exploring new techniques and materials allows me to truly make this build original. I have almost completed the mounts for the PSUs as well as the HD. 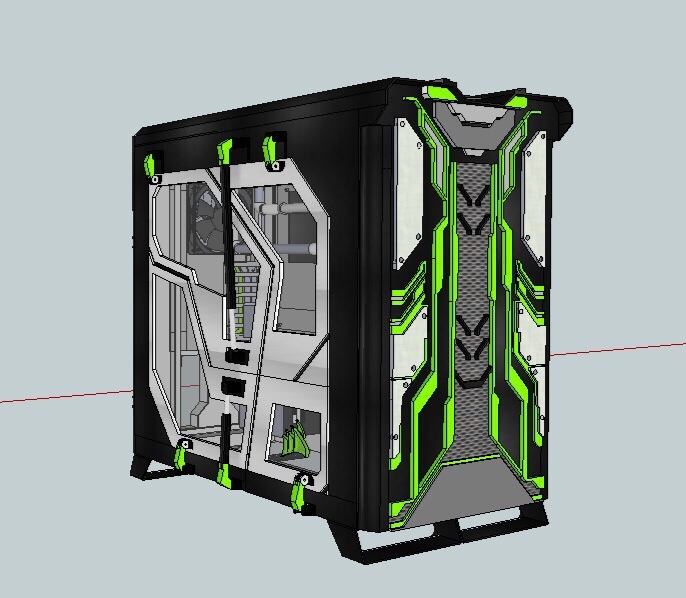 I still need to finish up the design for the HD shroud. I haven't decided if it'll be covered with some acrylic work or if I will have a cut-out for the HD. 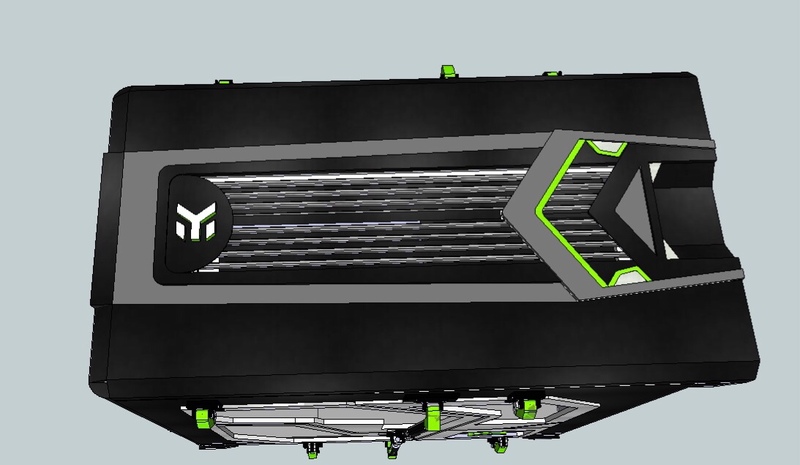 The PSU sub-mount will be the main support that holds the PSUs. I went with a method that keep the PSUs slightly above the base of the case. Its all one pieces as well which will allow me to easily remove it for future upgrades or maintenance. 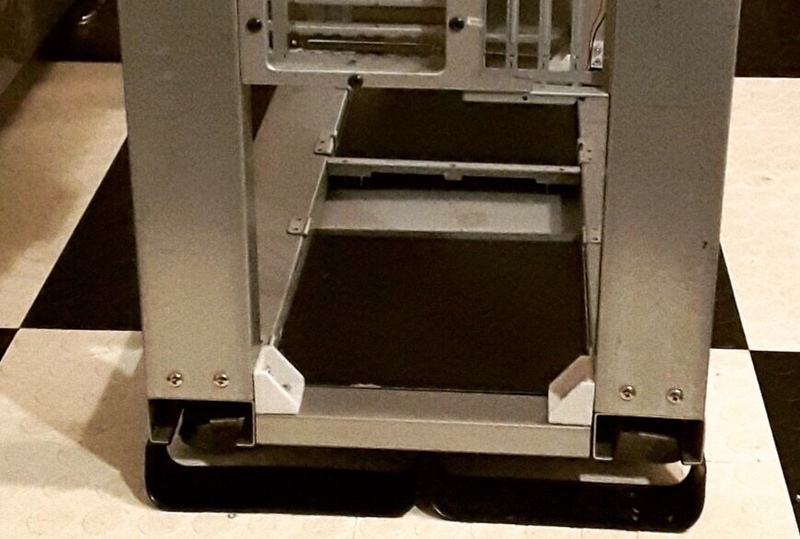 The bottom or floor of the floating PSU mount is finished. This slightly raises the base for the PSUs to the same level as the frames cross-bar. 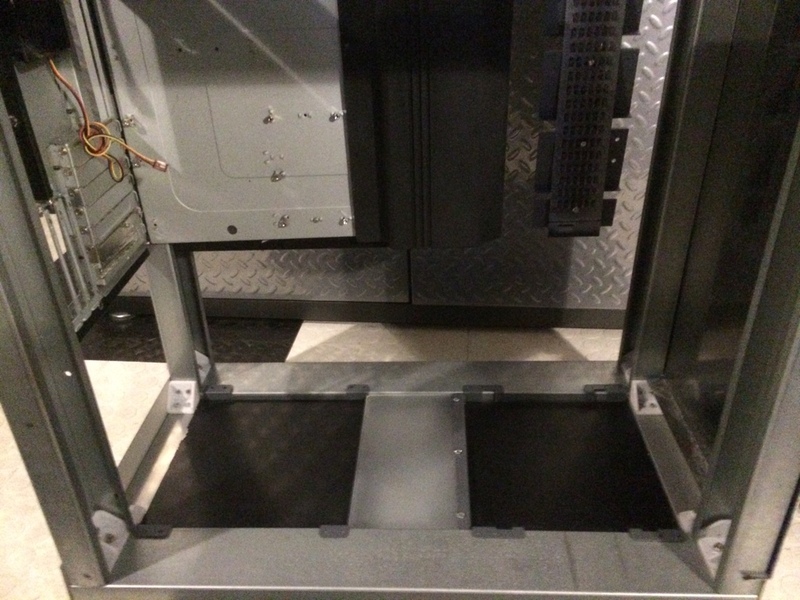 Eventually I will cut slots in the floor of the PSUs mount for added air circulation. A floating mount adds space for wiring as well. 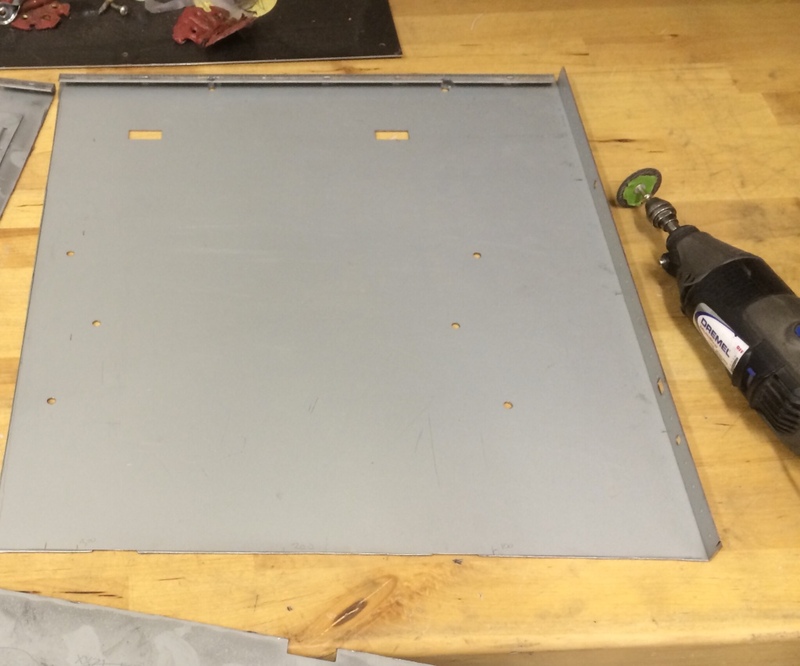 I have started to mockup the metal shroud for the mobo's main wiring. 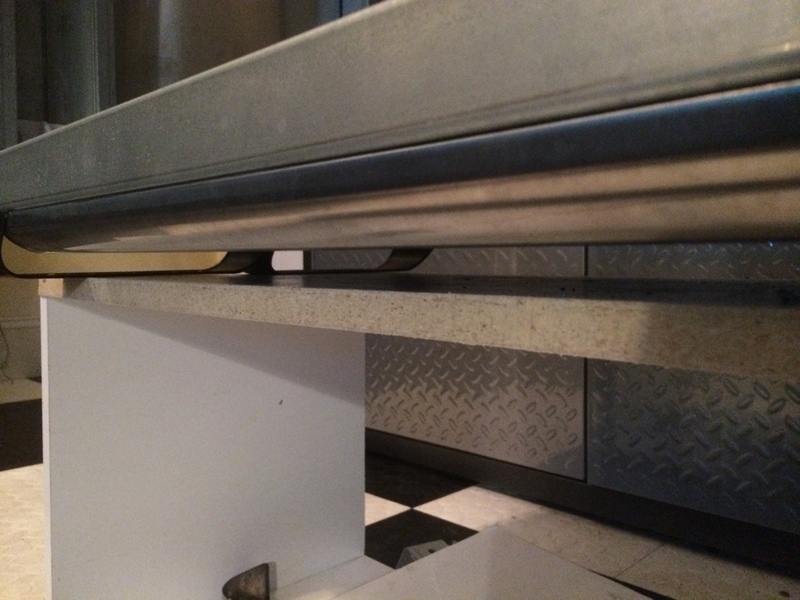 It comes out of the side of the passthrough and behind the metal shroud. 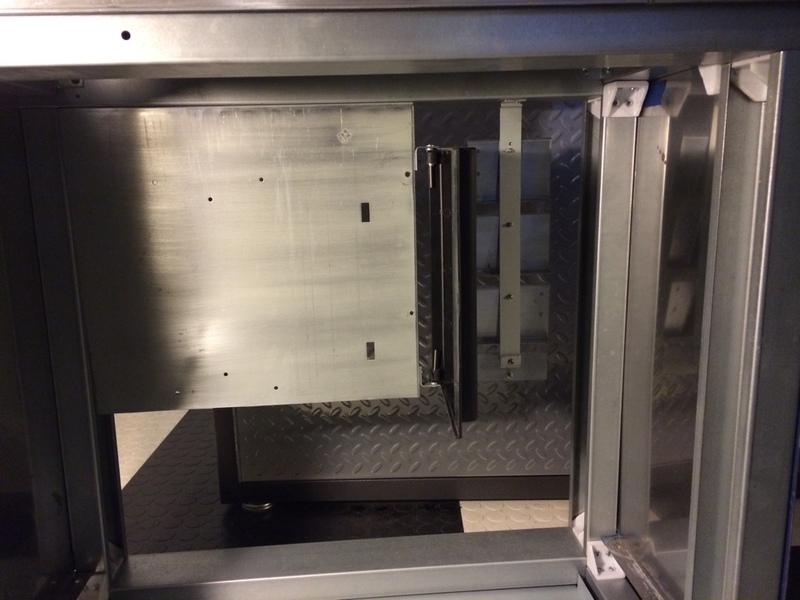 This metal shroud will have sections in it which keep all the wiring in order with the help of 3D printed cable combs. 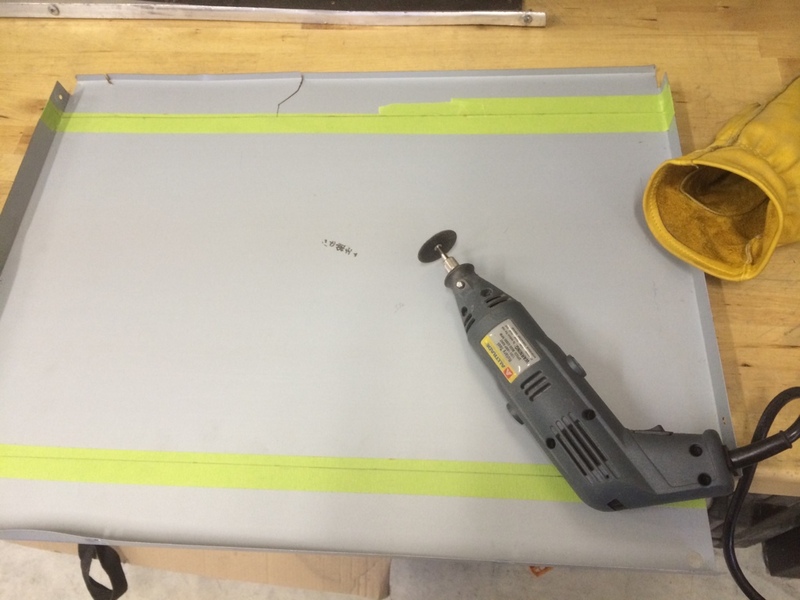 The outer portion of the metal shroud has an indentation that I am cutting a piece of thin acrylic for. I will release more information on this as it starts to come together. I will update with pics ASAP. 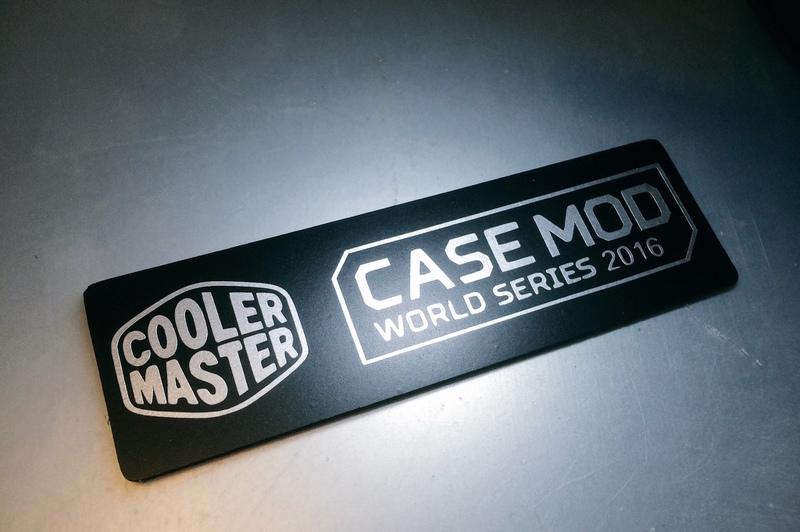 I had to re-cut the Case Mod World Series vinyl because I messed up when applying it to the acrylic backplate. Unfortunately I have involuntary hand jerks at time due to my brain damage. When I was just about to apply the 1st one my arm jerked and it was ruined. It takes a long time to weed small lettering in vinyl so it took a bit to get a second one ready to apply. This one came out perfect and I couldn't be happier with the way it looks. I also took the opportunity to test one of my new photography LED lights. I have another idea planned for this badge before it mounted in its final location. I am finally down to the last few layer of filler/primer and sanding. The more I look at the case the more it reminds me of an old IPod. As you may know I'm a stickler for the details in a build. I think the small details really do a great job of bringing the design together. 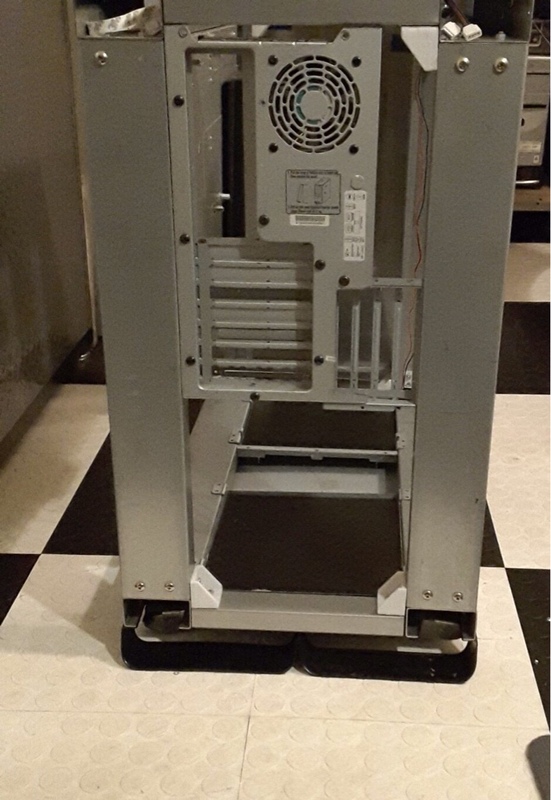 This case will go behind the front panel of the case so it really wont even be seen as mentioned. I still think its important to make it look like its a feature. 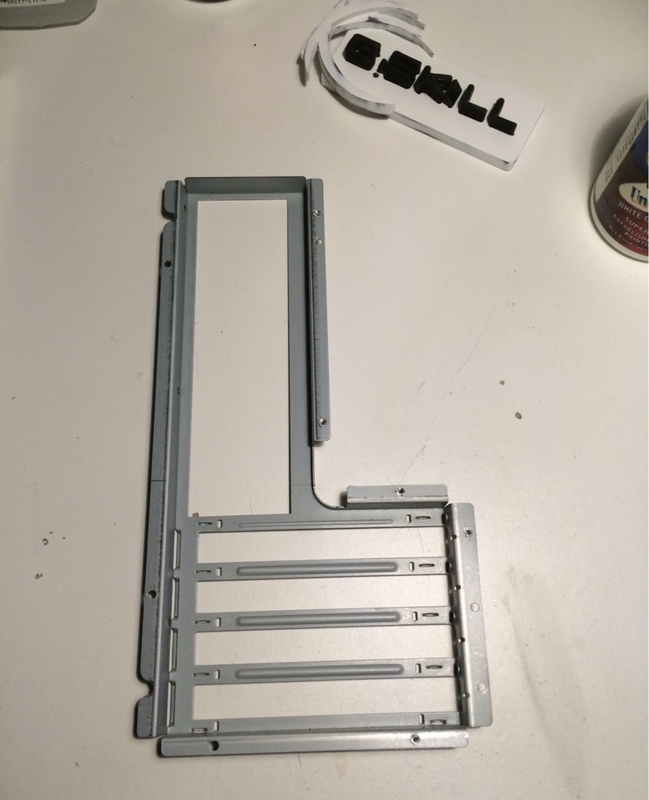 I had originally planned on doing a single or dual vertical PCI mount but, when looking at the donor parts I decided it would be neat to do 4. I have just enough width to add 4 of them next to the stock atx setup. This will give me a lot of options down the road. 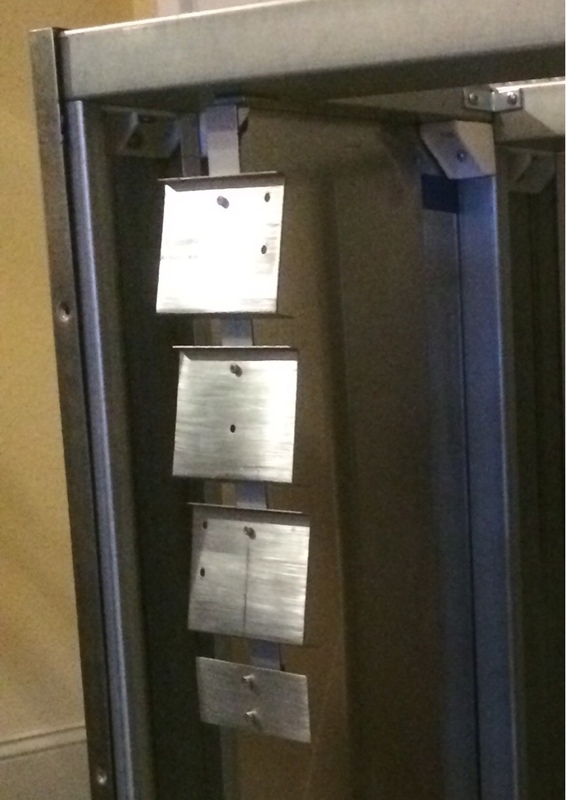 As of right now I have mounted 4 slots to see how I like it. The main advantage of having 4 slots is the ability to do SLI vertically which I've never seen done quite this way. 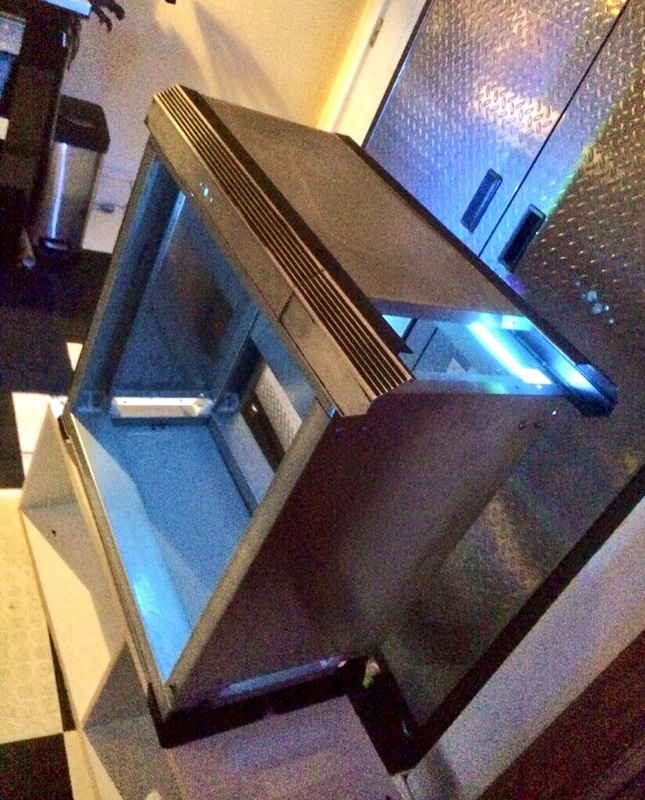 It also has enough space to water-cool the vertical SLI setup. I used the PCI slots from another old, smaller case in order to make the four vertical PCI setup. 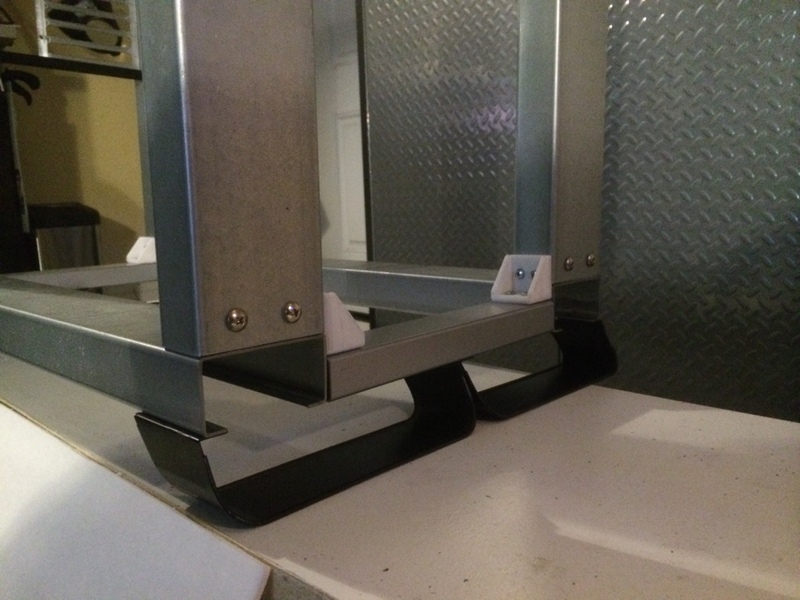 I finished up the insert plate for the 2nd floating mount. 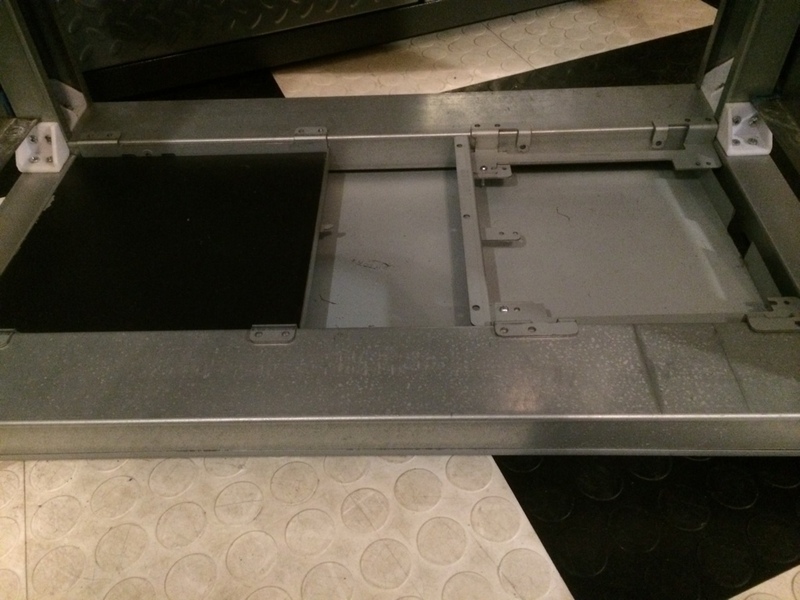 This plate is primarily for the full size hard drive and the pumps for the water cooling system. I haven't completely decided on what ill do for the section in between the two floating mounts. Some of it will be used for the cable management coming from the dual PSUs. 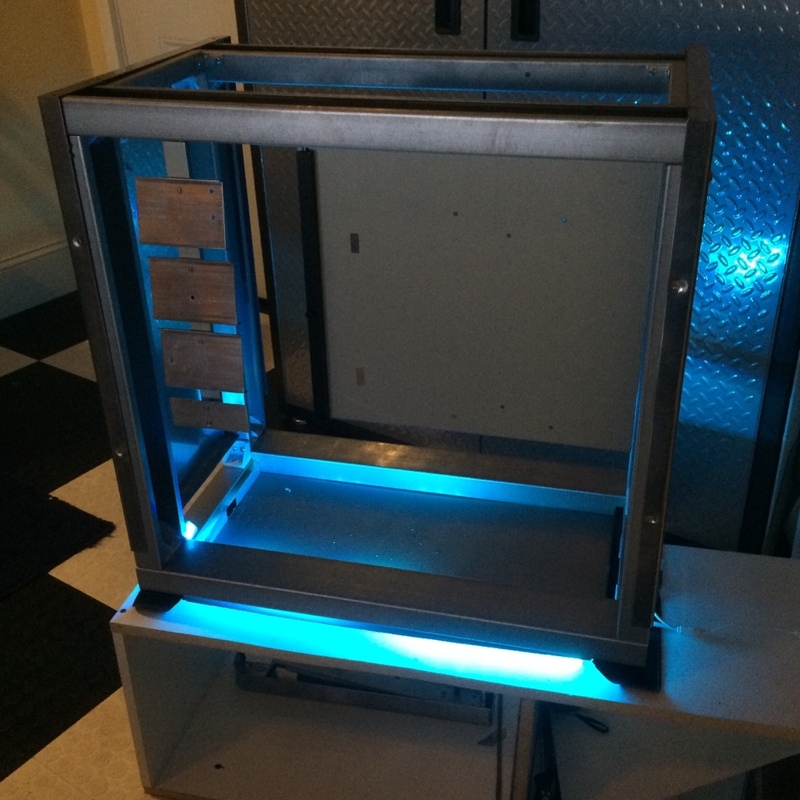 Ive started working on the space between the two floating mounts in the bottom of the case (on the inside.) I had spaced the lips between the two floating mounts so that there would be a 3mm gap. 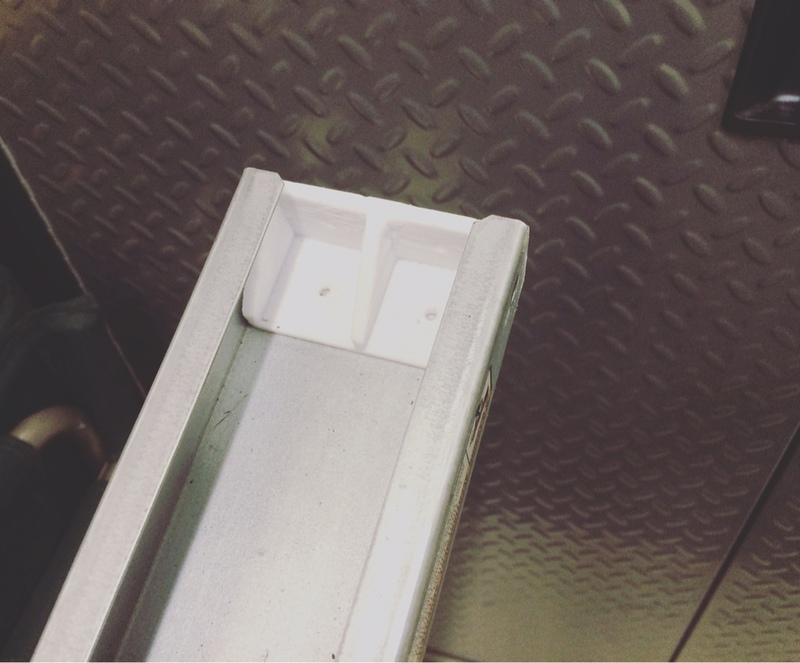 This gap was the exact thickness of the acrylic. I haven't completely decided how I'm going to finish the piece other than this piece of acrylic. More than likely it will make for a good location to do some sweet vinyl work. 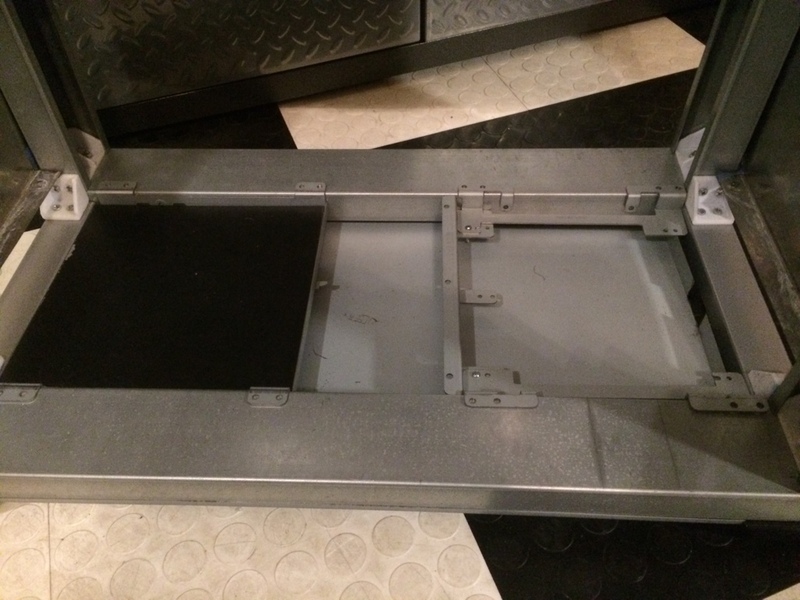 The primary reason for mounting the two “floating mounts” was to keep them above the actual floor of the case. That way I can mount the PSU, pumps etc without having wiring going everywhere. The platforms are raised about 20–25 mm which leaves a lot of space to run wiring. I have been recently hinting at a couple announcements for the build recently. 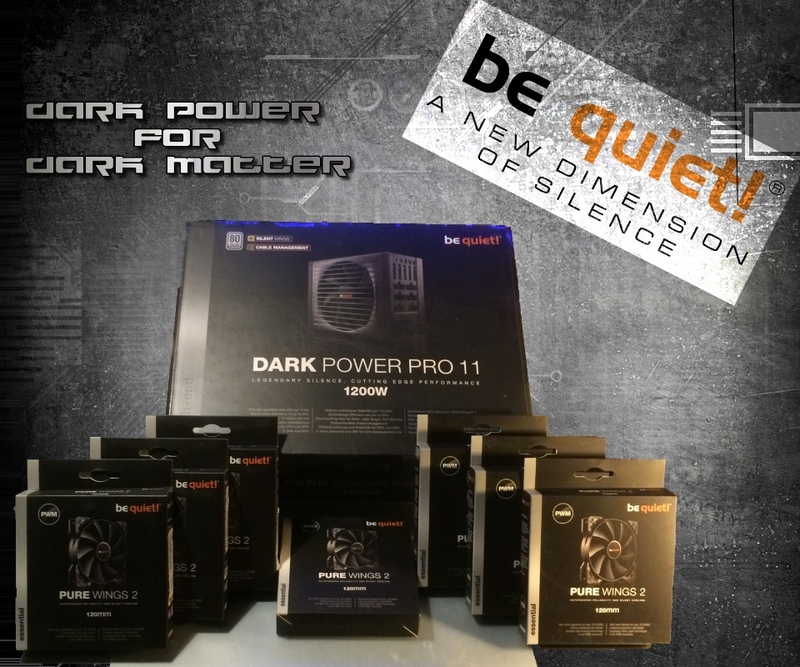 The major announcement is about BeQuiet joining the build and sponsoring Dark Matter. I will wait to announce the exact PSU and fans that I will be receiving until they arrive. 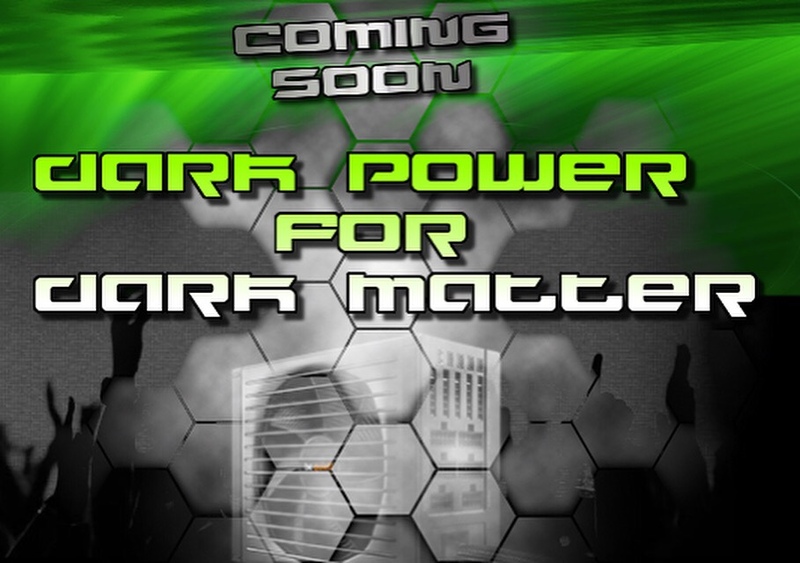 I can tell you that Dark Matter will be getting some Dark Power though. 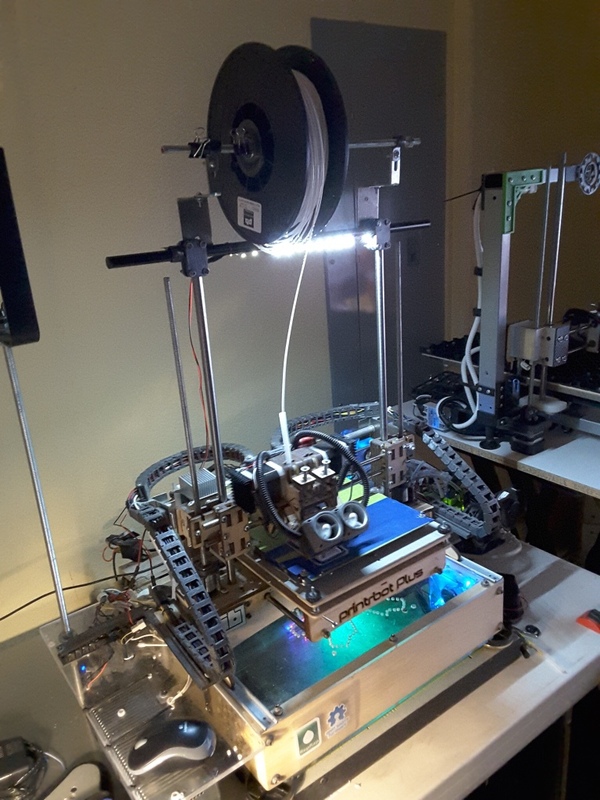 I would also like to thank BeQuiet as well as my other sponsors: (Printrbot and RantoPad) for believing in this build. You'll be seeing this monster at some shows this year for sure. 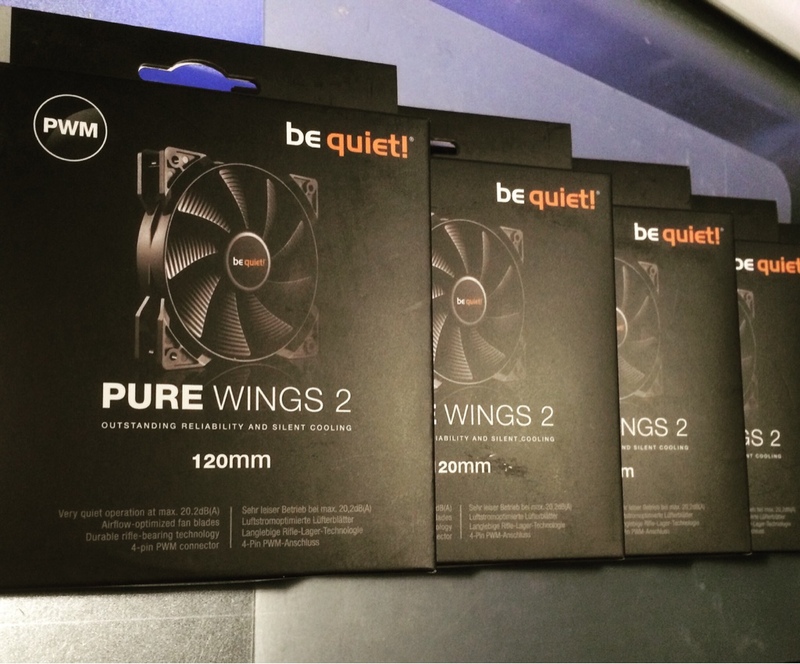 Today the parts arrived from BeQuiet. 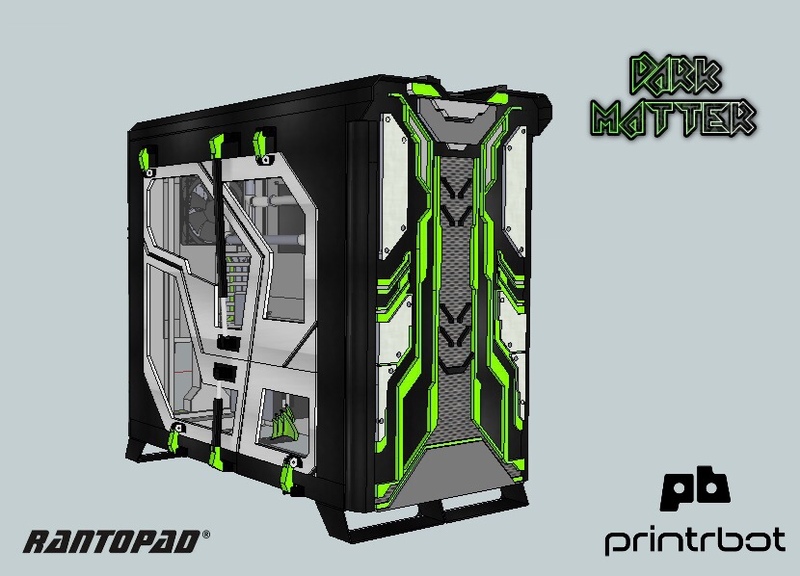 They sent one of their 1,200 watt Dark Power 11 Pro PSUs and 7 X 120mm PureWings 2 PWM fans that will be used throughout the case. 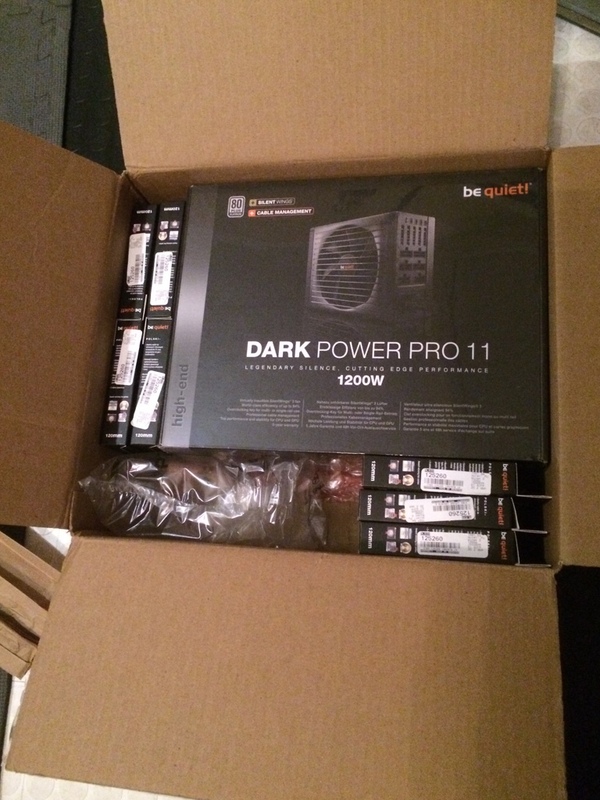 I am in love with this 1,200 watt, platinum rated and modular PSU from BeQuiet. You can tell that it is quality immediately after opening the box. It comes well packed and is comprised of some of the best components available. A neat feature is the ability to, “overclock” the PSU. 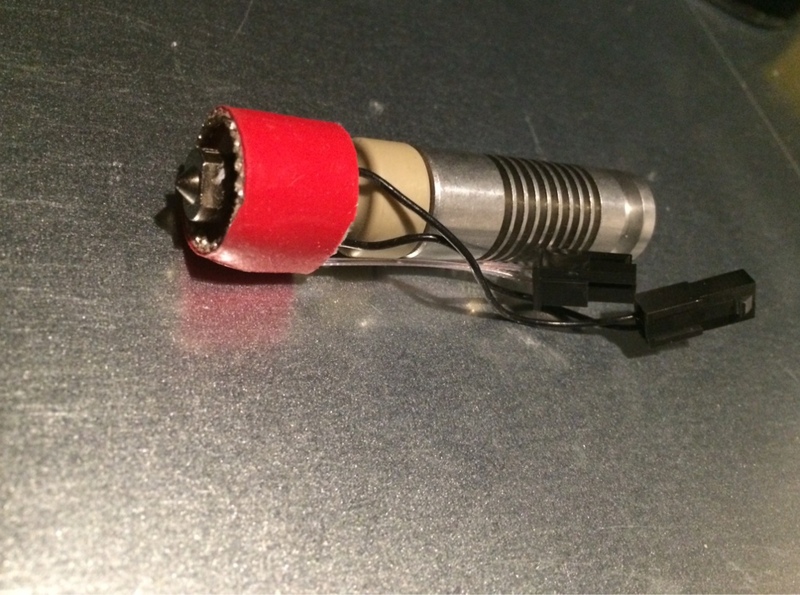 You can turn it into a single rail 12v that packs close to a 100 AMPS. Thats right I said, “close to a 100 AMPS.” If you prefer running multiple 12v rails; all you have to do is flick a switch. I can't wait to start mocking up this PSU. It also comes with every little do-dad you could ever want including a huge set of modular cables. I will be building a 3D printed cable management system for this setup. The rear fan on the donor parts used is an 80mm fan. 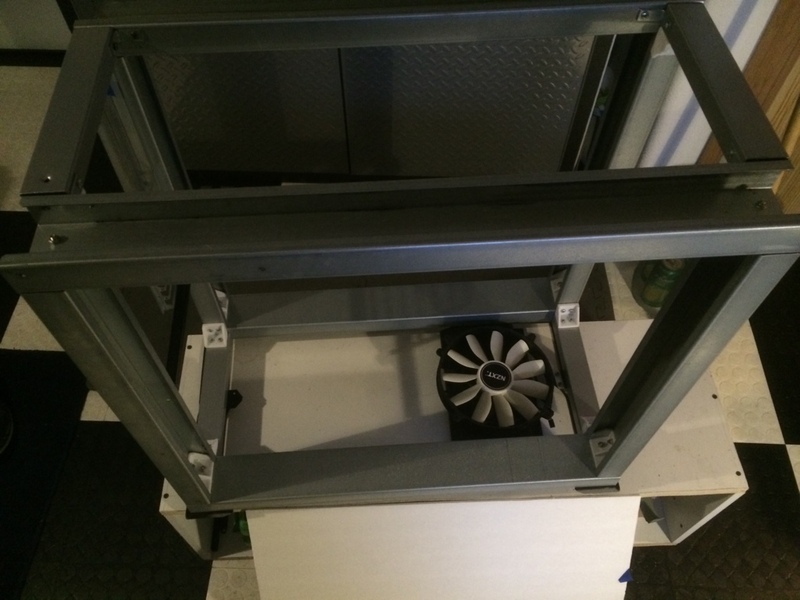 Almost all newer cases have a 120mm fan or larger in this position. 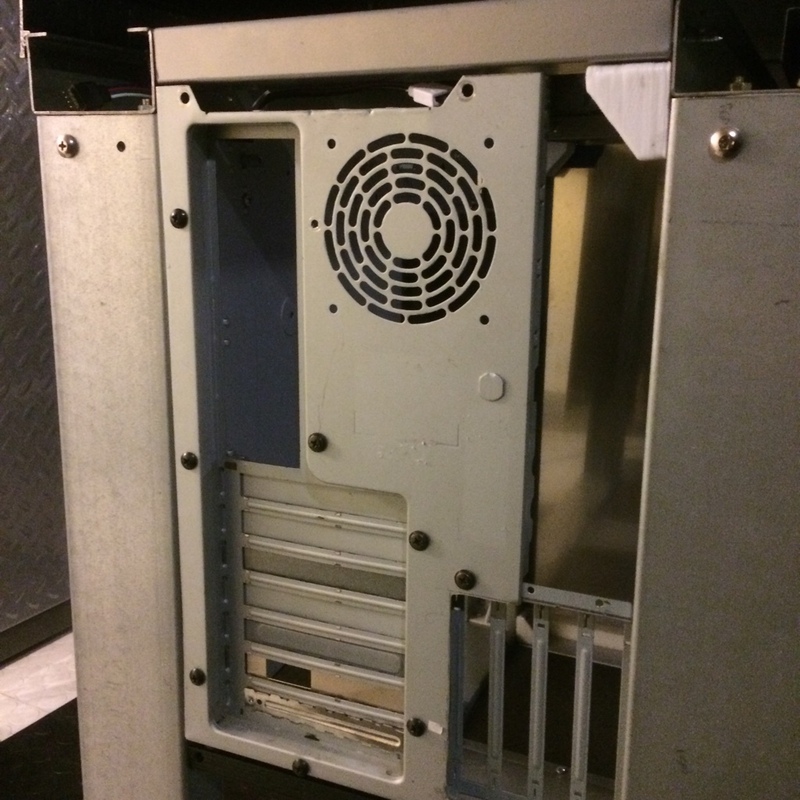 I will cut out part of the old donor backplate to make room for the new 120mm fan. 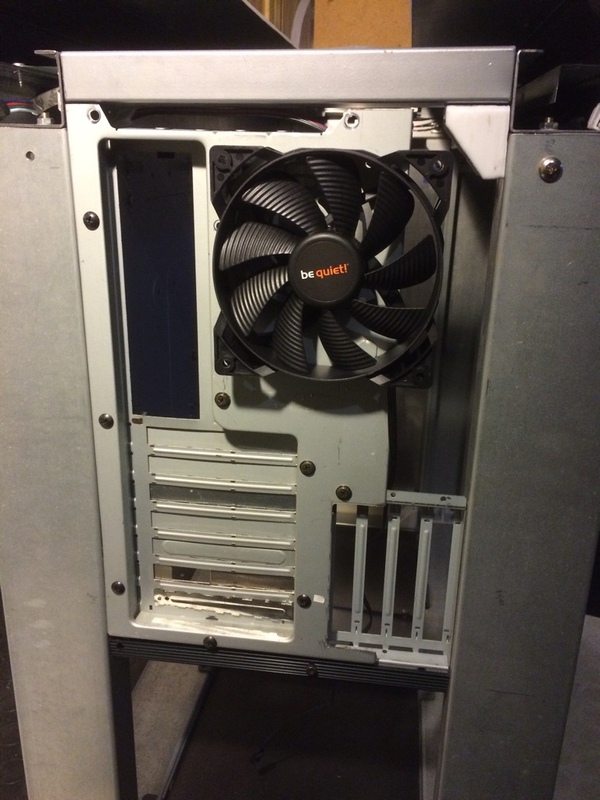 Once the final back panel is fitted you wont be able to tell that there was ever an 80mm fan. Its always easier to go larger than smaller as long as you have enough space. 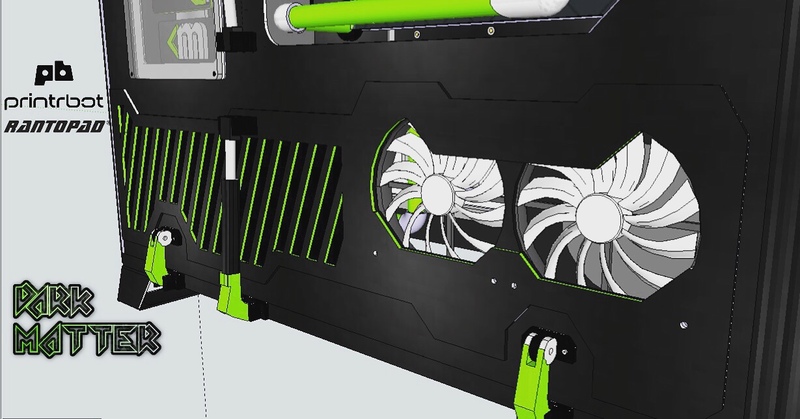 This wont be diffacult due to the fact that I designed the case to have 120mm fan. I will use one of the screw holes from the 80mm fan to position the new 120mm fan. Once I level the fan I can drill the second mounting hole. 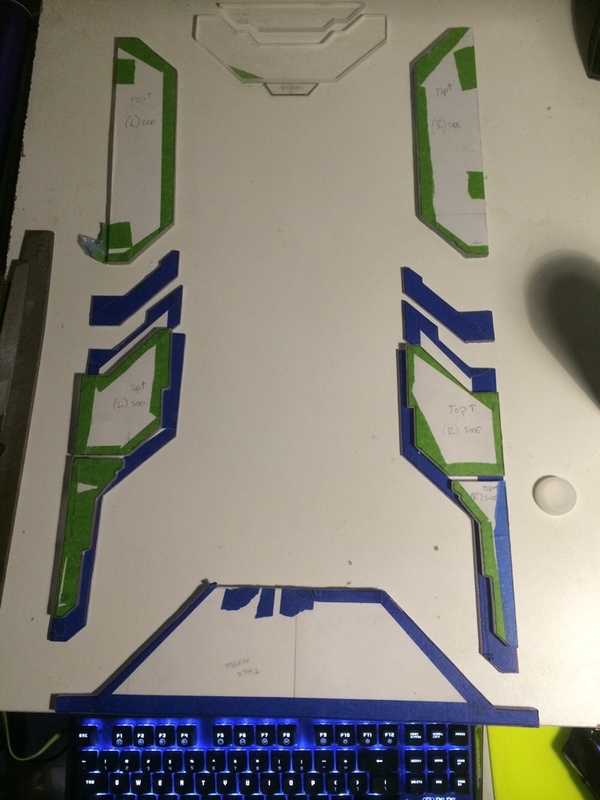 All I have left to do is cut out part of the backplate to give the 120 enough space.